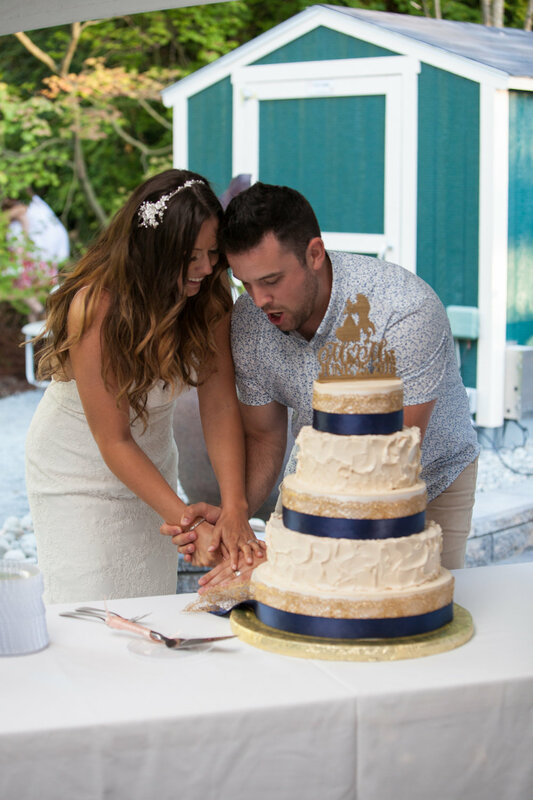 Your wedding day is a beautiful celebration of love… but it can also be stressful especially if you are trying to remember all the fine details to make it go flawlessly. Why not take some of that stress off of you? 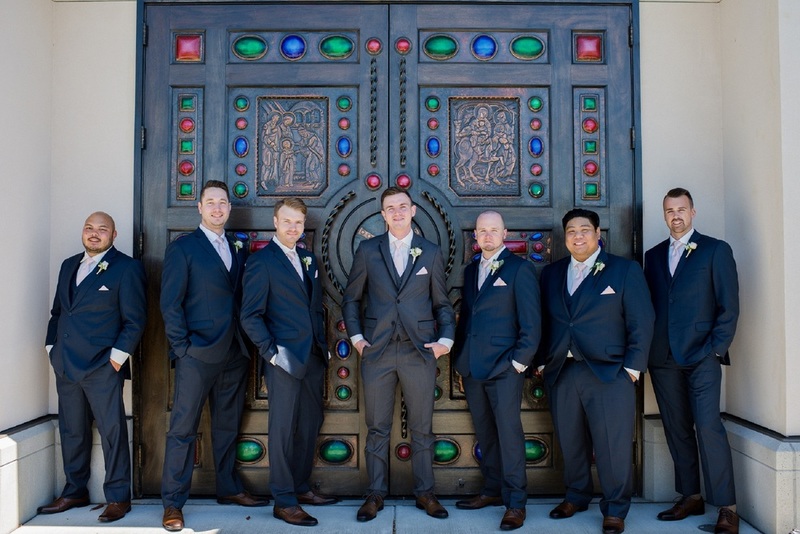 Here are 5 reasons you should hire a day of coordinator for your wedding, so that you can relax and be more present on your special day. Timeline: A day-of coordinator will provide you with a detailed timeline that will list where everyone needs to be and when. 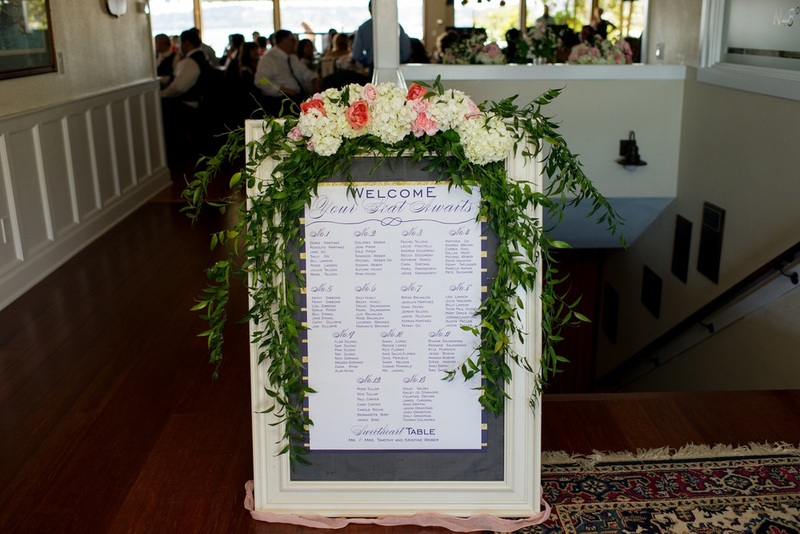 All that needs to happen the day of your wedding will be on that timeline, from when the caterer arrives to what time your bridal party needs to be ready to walk down the aisle. 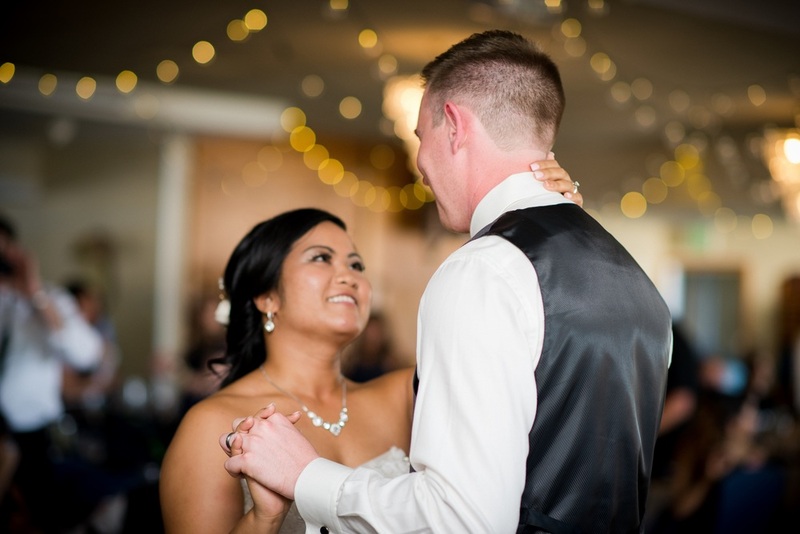 This will help take the stress off you, giving you time to enjoy the most important day of your life, while your coordinator remembers what needs to happen and when. They will keep you on schedule, so that you don’t run out of time at the end of the night. 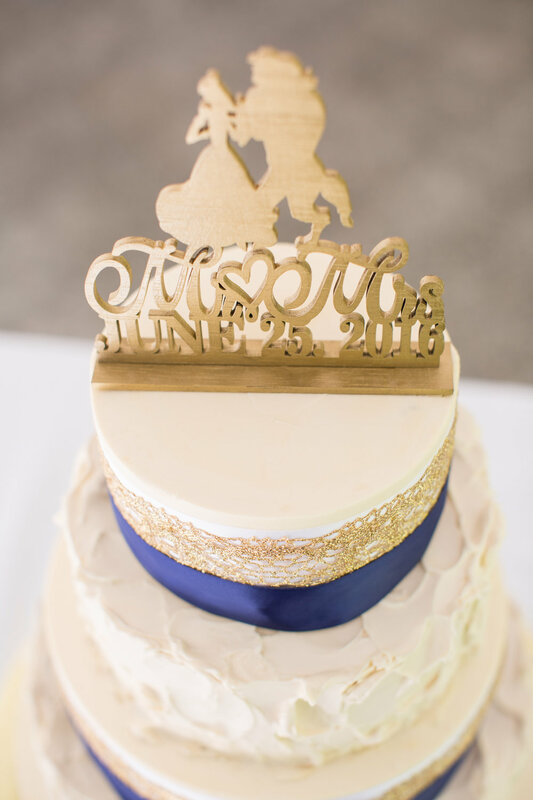 You don’t want to be stuck in a situation where you need to be out of the venue by 11 pm, you have planned multiple special dance numbers, but it is already 9:30 pm and you haven’t done the cake cutting yet! 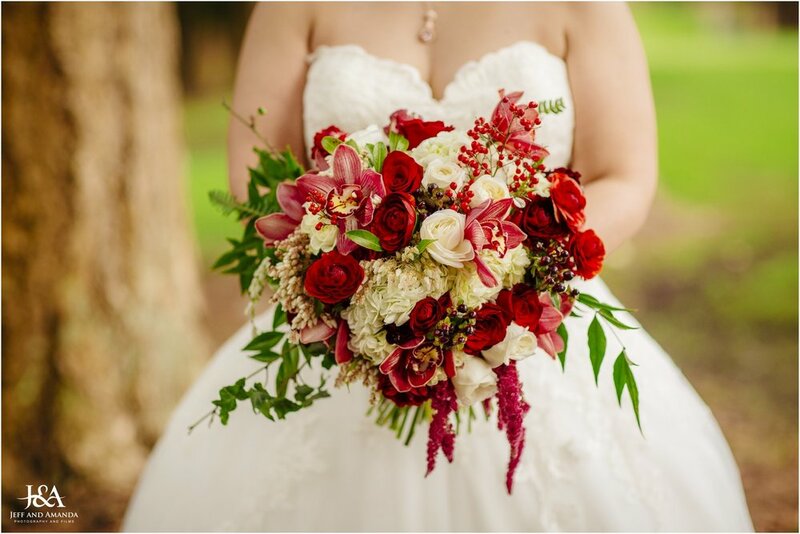 Confirmation with Vendors: On top of managing your timeline, your day-of coordinator will be in communication with all of your vendors (florist, bakery, caterer, photographer, etc.). 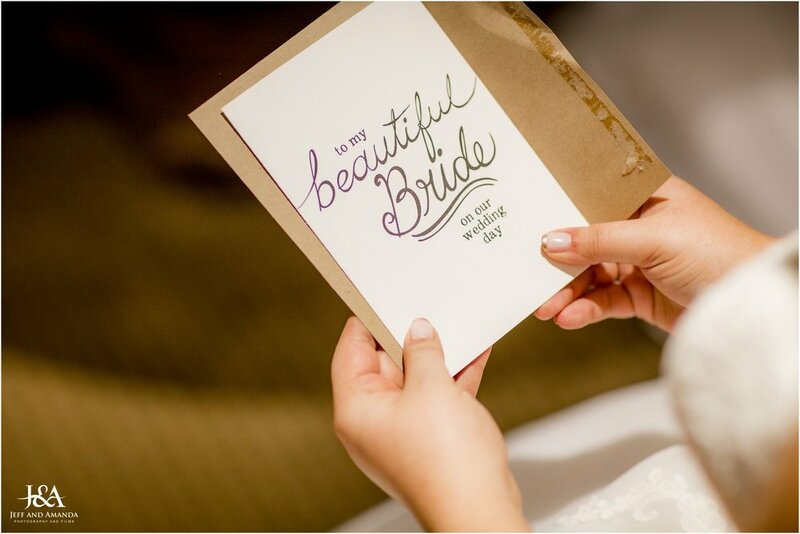 They will correspond with all vendors before the day of the wedding, confirming dates and delivery times. This way everything goes smoothly and according to the timeline you agreed on. 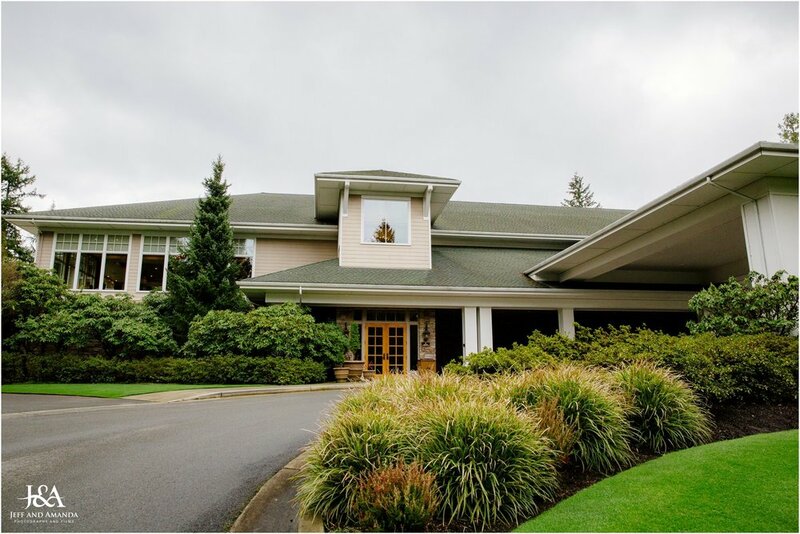 Your coordinator will be at the venue day of the wedding to greet all vendors, and get them settled in. This will help prevent any miscommunications around deliveries. I was at a wedding once that did not have a day of coordinator, and the flowers accidently got delivered to the kitchen. 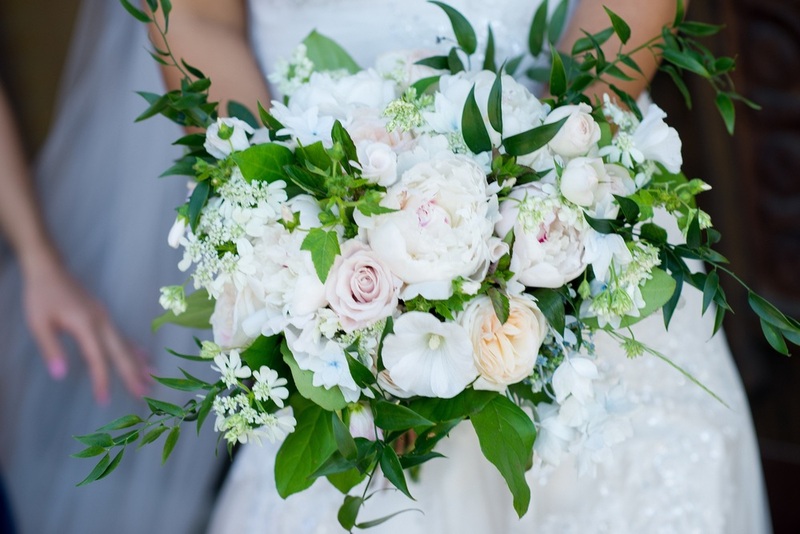 It was time for the bride to walk down the aisle, but she did not have her bouquet! All her guests were waiting in their seats for the ceremony to start, and they had to sit there for an extra 30 minutes while I ran around the hotel asking everyone who worked there if they had seen a large flower delivery. It was a nightmare. Don’t let this happen to you! Set Up/ Take Down: Picture this, you’ve just had your dream day and you’re ready to drive off into the sunset. You take one last look around and then it hits you. You have to clean all of this up. Not so, when you have a day-of coordinator. Another great service the day-of coordinator provides is coordinating set up and take down. They arrive at the venue early and get everything organized. They will make sure all vendors get set up properly, along with the table arrangements, chairs, decorations, etc. They will also stick around at the end of the night with a venue checklist to make sure everything gets cleaned up and taken down. This makes it so you can leave the reception whenever you are ready. At this point of the night, you will most likely be exhausted and not wanting to worry about clean-up or getting those last few dancers off the dance floor :) This also takes the stress off your friends and family, so you don’t leave your aunt Betty peeved that she got stuck cleaning up the mess! 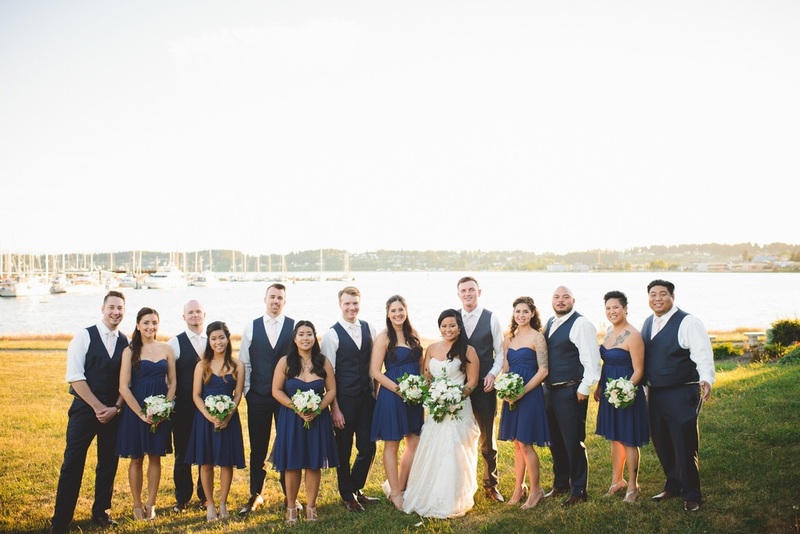 Coordinating Bridesmaids/ Groomsmen: It’s your rehearsal day and you want to get everyone ready, you’ve seen tons of weddings before, but all of a sudden you don’t know how to prepare. How long should you wait in between couples entrances? When should music cues happen? In comes your day-of coordinator to sort all of that out. 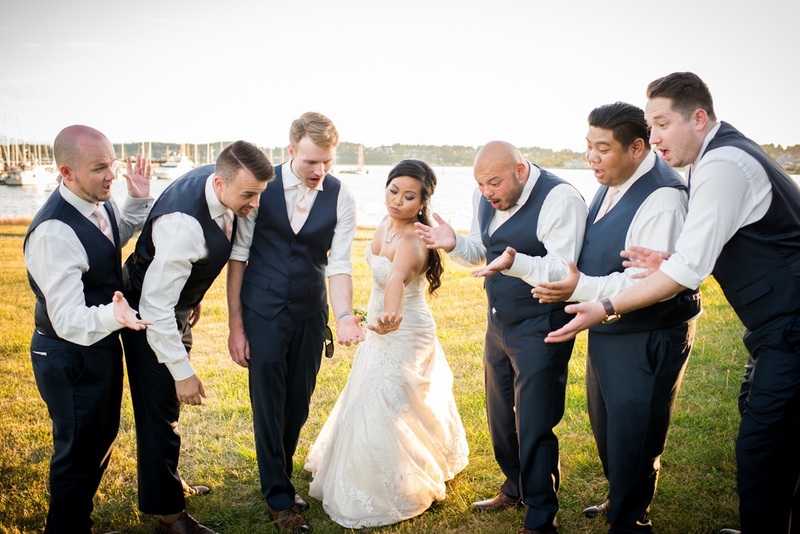 If one of your bridesmaids or groomsmen wasn’t there for the rehearsal, your coordinator will be there to assist them with where to go and when; making your walk down the aisle look effortless. 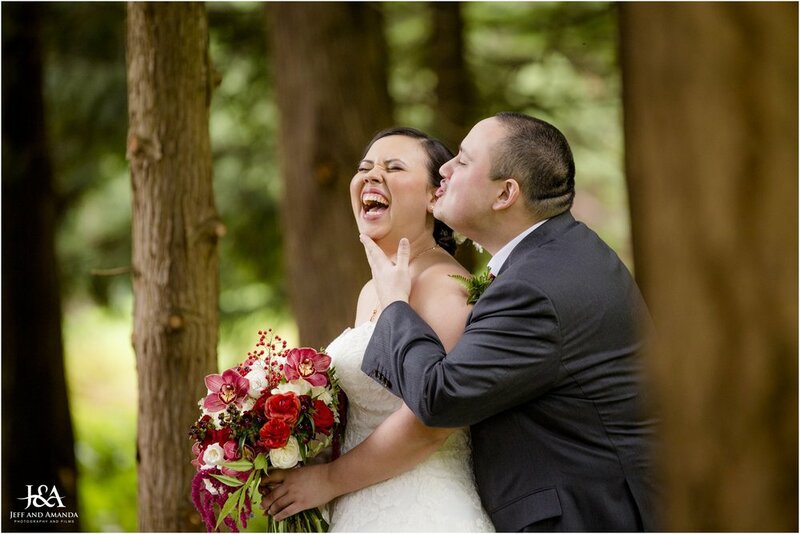 Stress Relief: The number one reason to hire a day-of coordinator is to relieve your stress on your special day. 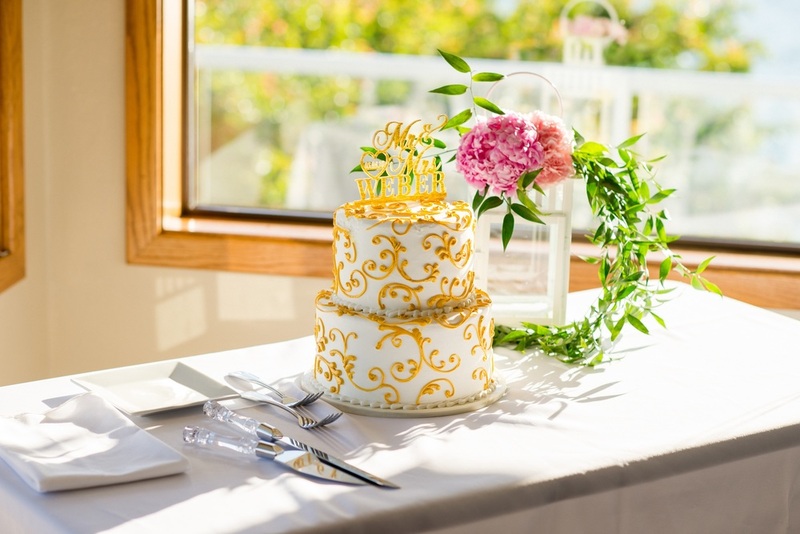 When you wake up the day of your wedding you do not want to be thinking about what time is the cake getting delivered? Did I remember to confirm times with the caterer? Are my bridesmaids going to be there on time to set up the table arrangements? With a day-of coordinator you won’t have to worry about any of that. Are you stressing out about family drama? Is my mom going to be able to handle being in the same room as my dad’s new girlfriend Shelly? Is my great uncle Bruce going to have one to many glasses of wine and start talking politics with my mother in law? Is my dad going to be upset that he had to wait in line behind my cousin Tina’s entire family at the buffet table? 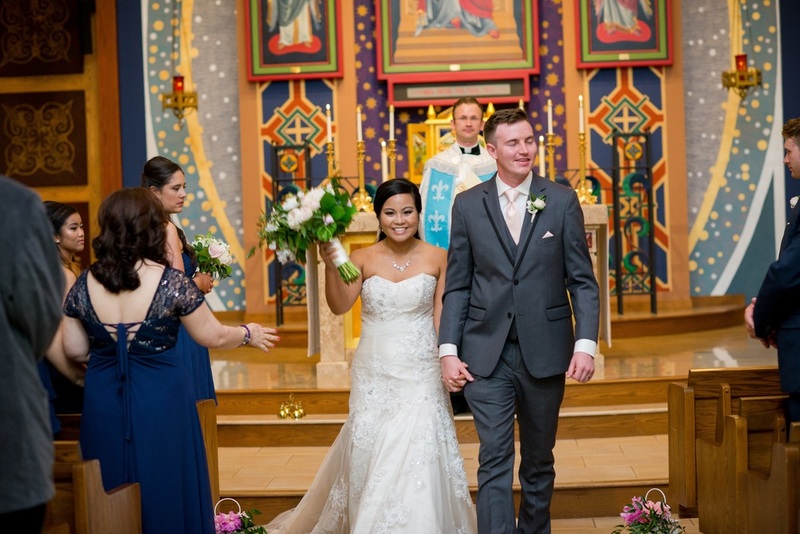 Again your Day-of coordinator is there to help handle all of that, so you can focus on what really matters; starting a life with someone and celebrating that with your friends and family. You've spent the better part of a year planning, and the big day is almost here. 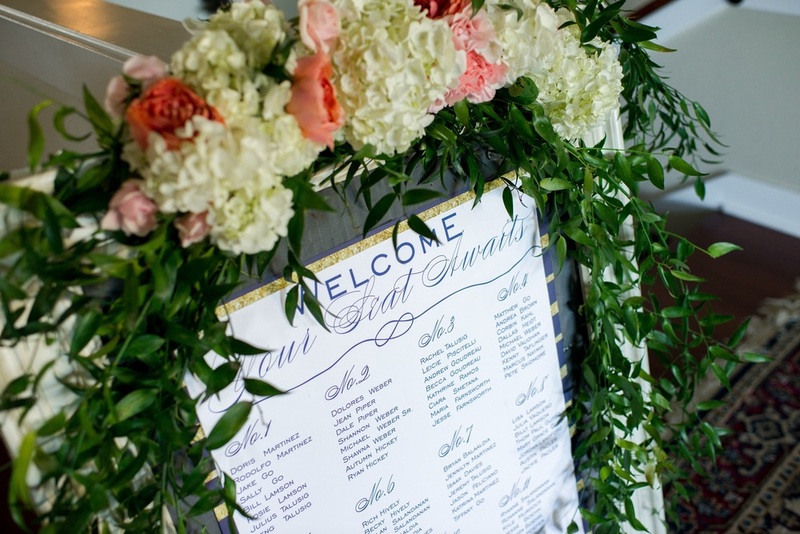 The décor is ready to go, you've checked in with your vendors, and your dress fits like a dream. 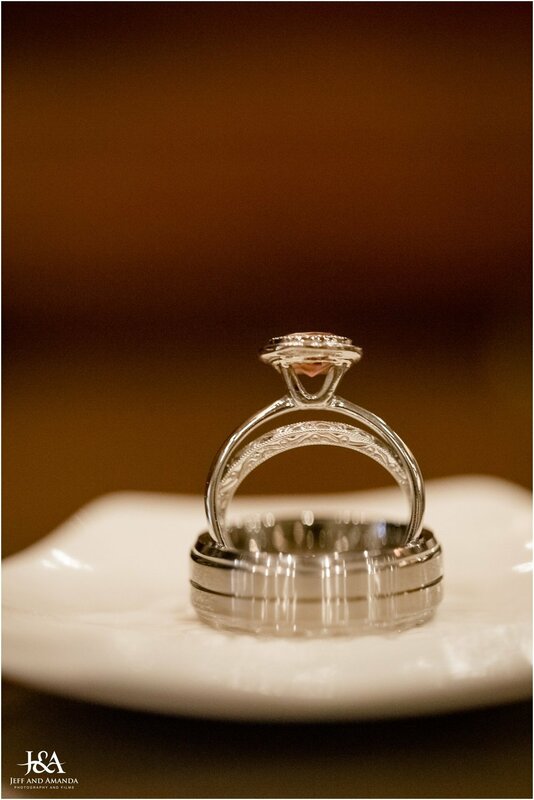 Everything is perfect for your wedding day … almost. Unless everyone is staying at a hotel throughout the festivities, you'll want to take these steps to get your home ready for the big event, too. It's not uncommon to host relatives at your home when getting married locally. Older parents and grandparents appreciate a home-like environment over holing up at a hotel and eating meals out. Ensure your home is comfortable for guests by putting fresh bedding and towels in bedrooms, clearing out closet space for guests to use and decluttering the coat closet so everyone's items can fit. Apartment Therapy suggests a few more things you can do to make houseguests more comfortable and your life easier. 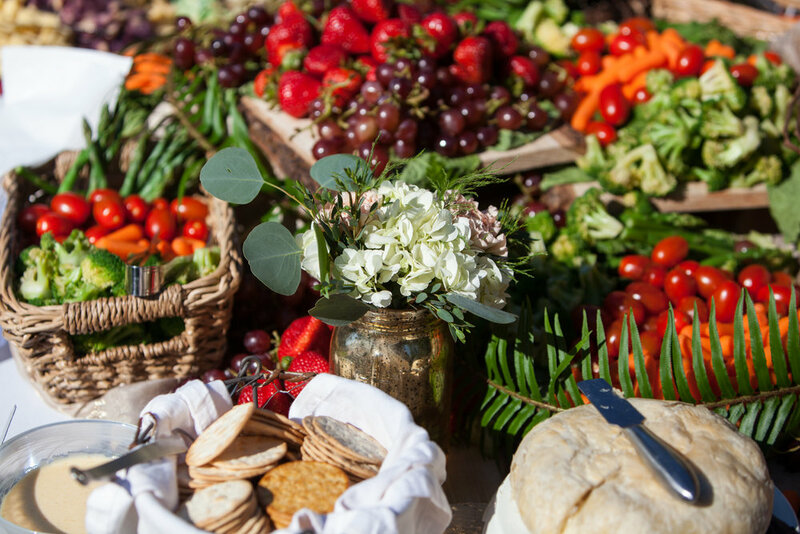 You'll want to eat well the week of your wedding so you feel your best the day of the nuptials, but with the chaos of wedding prep you may not find time to cook. Stock your refrigerator with healthy snacks like cut vegetables and hummus, raw nuts, and fresh fruit. 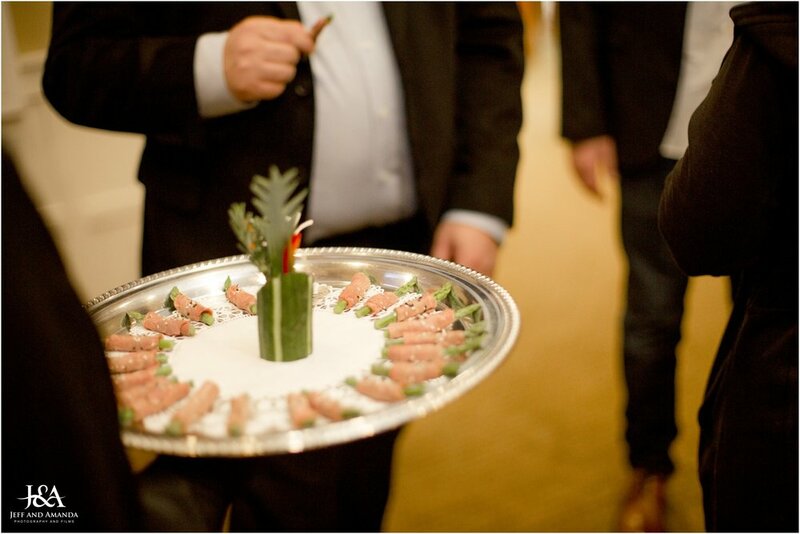 If you'll be hosting guests, ask about dietary restrictions and preferences and shop accordingly. Don't forget to purchase coffee and tea, cocktail supplies and finger snacks for mingling the day your guests arrive (Food52 names the essentials). 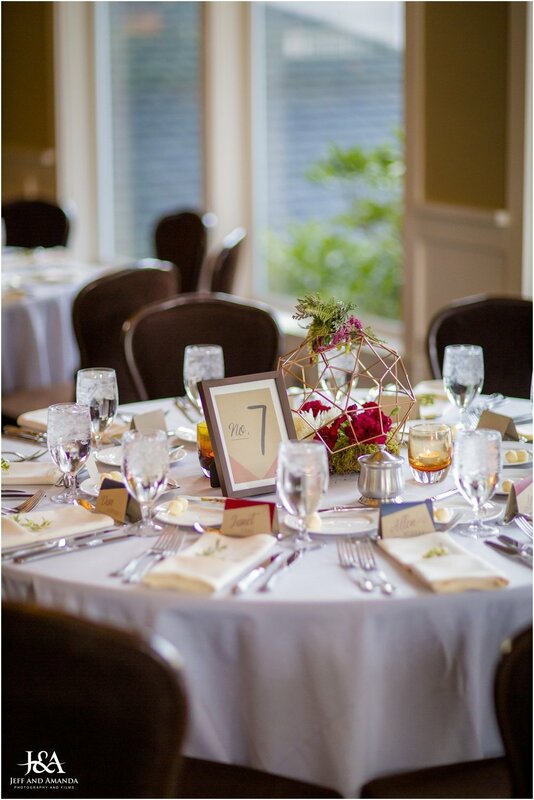 In the days leading up to your wedding, your focus should be on the big event, not keeping your house clean with guests. If family is staying with you, delegate chores to ease the burden. If one person washes the bath towels while another loads the dishwasher daily, you can focus on quick and easy tasks like wiping down kitchen and bathroom counters once per day. With people walking in and out constantly, the floors will the hardest to keep clean. You could vacuum daily, or you could spend a little bit on a robotic vacuum cleaner and not worry about it. While some robotic vacuum cleaners are costly, there are some great, affordable options on the market that are worth checking out. From the moment you wake up on your wedding day, you should feel like royalty. If you're staying at home before the wedding, give your sleeping quarters the bridal treatment. Replace your quilt with a fluffy white comforter and pillowcases to match, hang romantic curtains in the windows, and replace surface clutter with bouquets, candles and other charming touches. In the bathroom, clear the counters and lay out your wedding day beauty essentials. 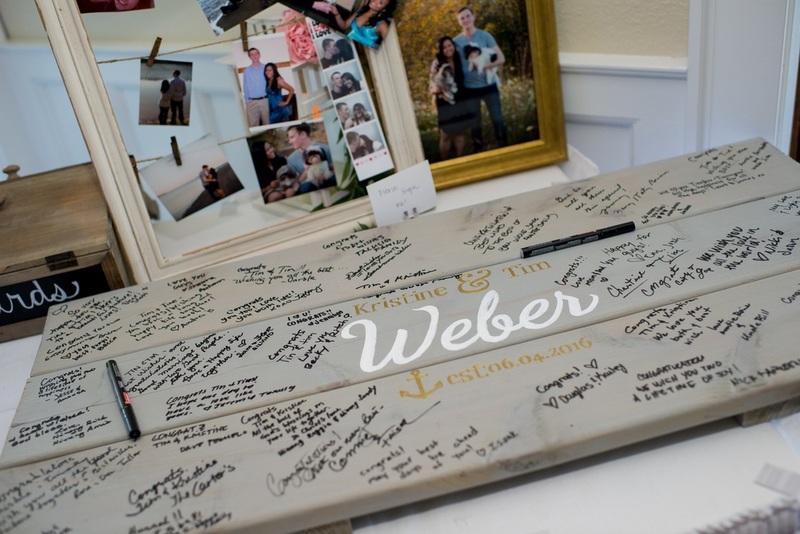 You probably won't touch the mountain of wedding gifts until you're back from the honeymoon. Keep gifts from taking over your house by establishing a drop zone ahead of time. However, you shouldn't hide them in a spare closet — if a gift-giver sees, it could hurt some feelings. Prepare a table or area of your living room where gifts can be arranged nicely until your return. 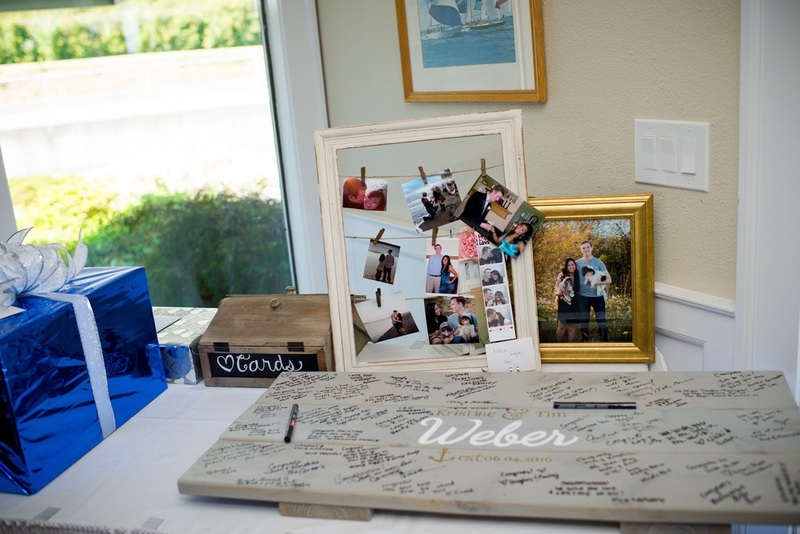 Your home may not be the center of your wedding festivities, but that doesn't mean your guests won't see it. You may be hosting family, getting dressed for the wedding at home, or just running back and forth preparing for the big event. 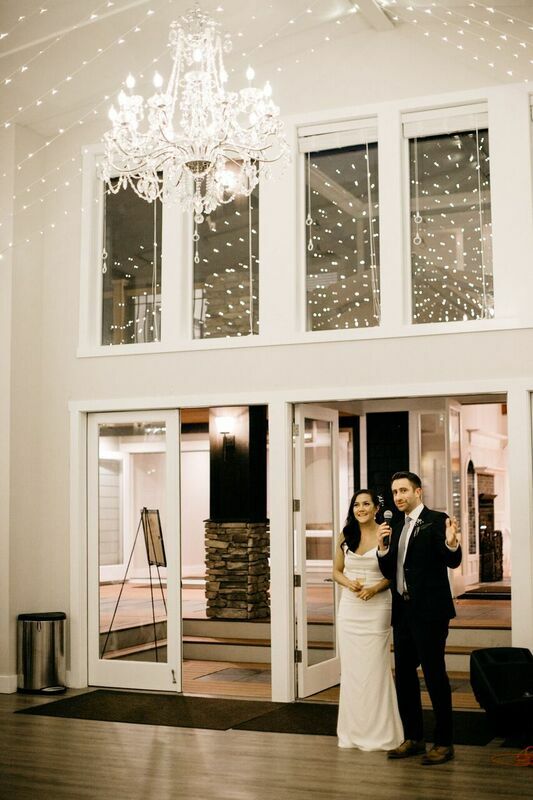 In any case, your home should help set the mood for your nuptials, not be yet another thing to worry about. 10. Waiting to start your planning. You get engaged in September, and you want to get married next August, you have almost a whole year to get the planning done so you can take your time, right? Not necessarily. if you're getting married in peak season (May through September), remember so is almost everyone else and you're now competing with other couples for the best local vendors. 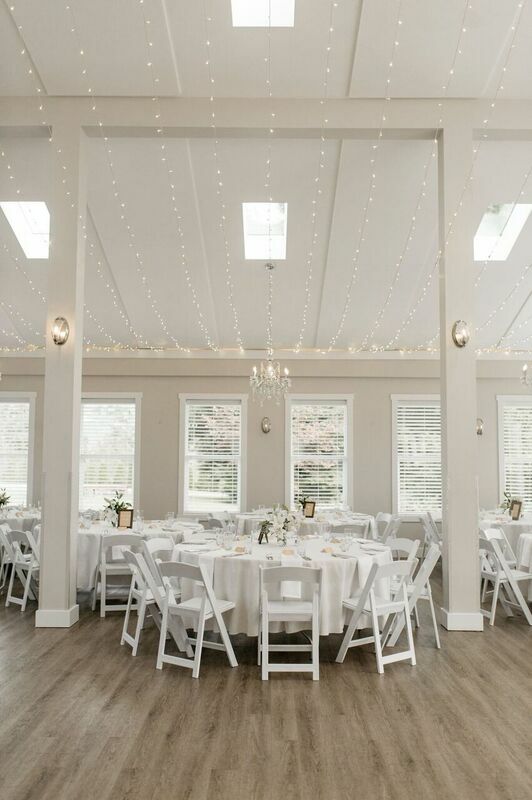 For instance, in the Seattle market, venues will often book over a year in advance. Once engaged, take a couple weeks to relish and rejoice, but then get started. 9. Not leaving enough time to order your wedding dress. Wedding dresses from shops that don't sell off the rack can sometimes take up to 8 months to get your dress in once the order is placed. The average amount of time is 4-6 months, but we recommend you leave yourself plenty of time just in case. We understand you'd like to maybe lose 5 more lbs before trying on dresses but honestly, paying for alterations to make it fit like a glove are much cheaper than paying for a rush order on a gown. 8. Not working off a budget. 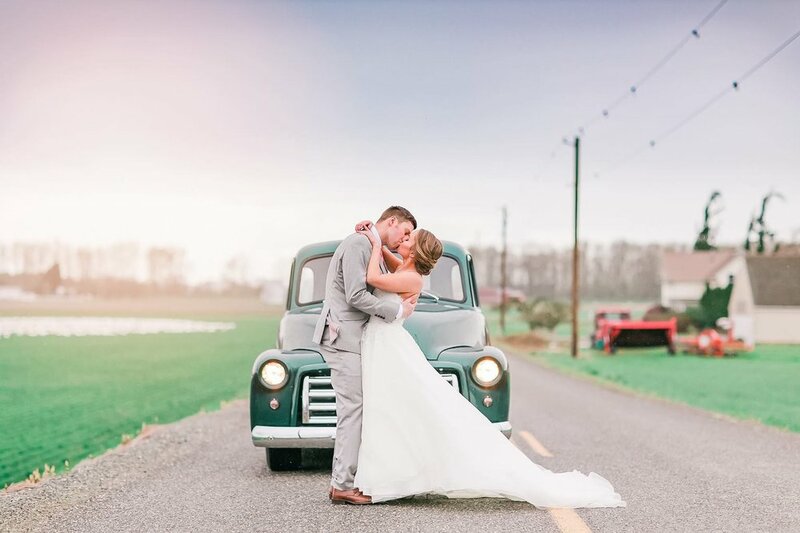 A typical couple making this mistake will book their venue, caterer, photographer, and then buy a dress and realize they've exhausted their financial resources. To avoid this mistake we recommend you sit down with a professional event coordinator at the beginning of planning and allocate roughly where you will be spending your money. For example, you'll find that if you have a 200 person guest count you may be spending close to half your budget on catering alone! 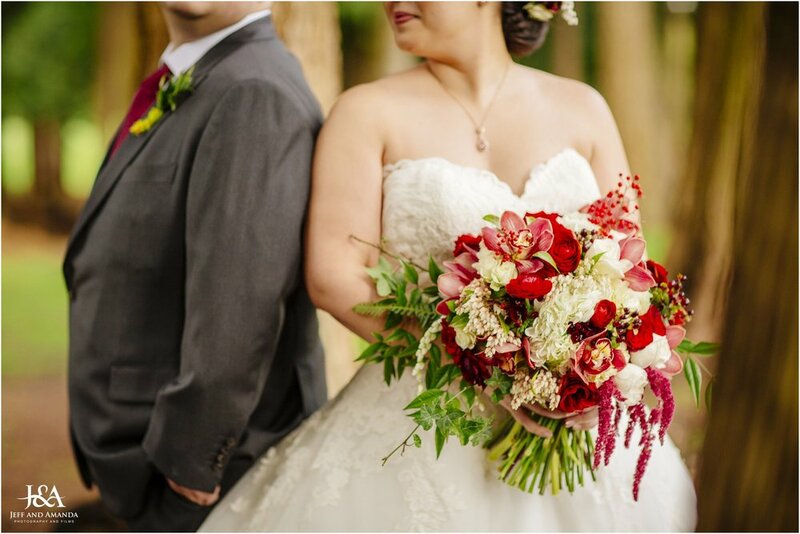 It's Your Day Events can create your dream wedding by focusing on the things most important to you; while keeping you in budget with leveraging our extensive vendor relationships, knowledge, and discounts. 7. Number of invitations to order. This one happens all too often. You are inviting 100 guests, so order 100 invitations, right? No! Unless all 100 of your guests are single and live alone, that is way too many. Most likely you'll need about half of that. This is why getting your guest list together early on is so important. You'll want to order enough invitations for each household your are inviting. 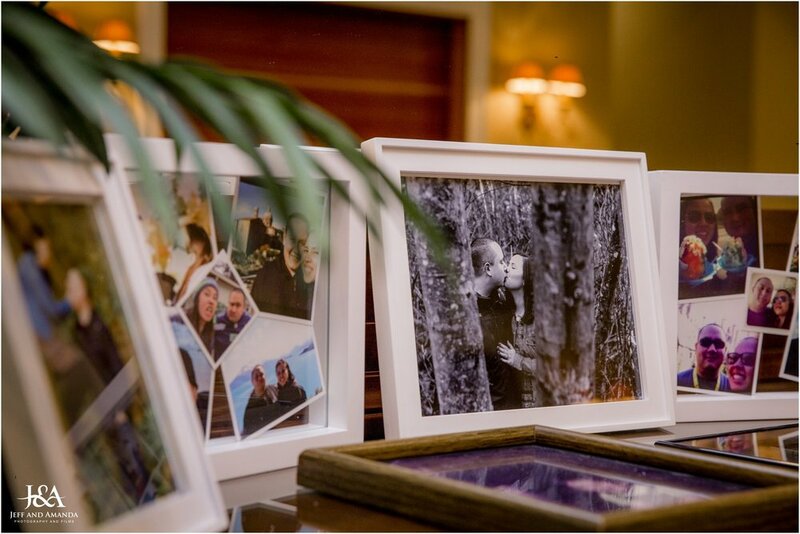 Pro Tip- Order a few extra to be safe, as well as one for your photographer- they can take pictures of it on your wedding day. 6. Copying a design trend you saw on Pinterest. Ahh the Pinterest worm hole- it gets us every-time. Pinterest hosts a wealth of images, and beautiful ones at that! 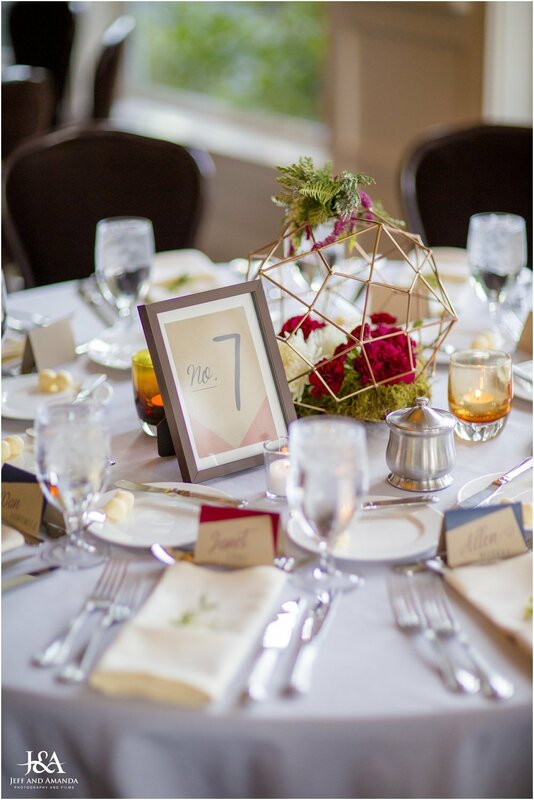 However, there are a couple things to watch out for when searching for that wedding inspo. 1. Most of the pictures you see on Pinterest are not new- the majority are at least 4-6 months old, or even a year +. 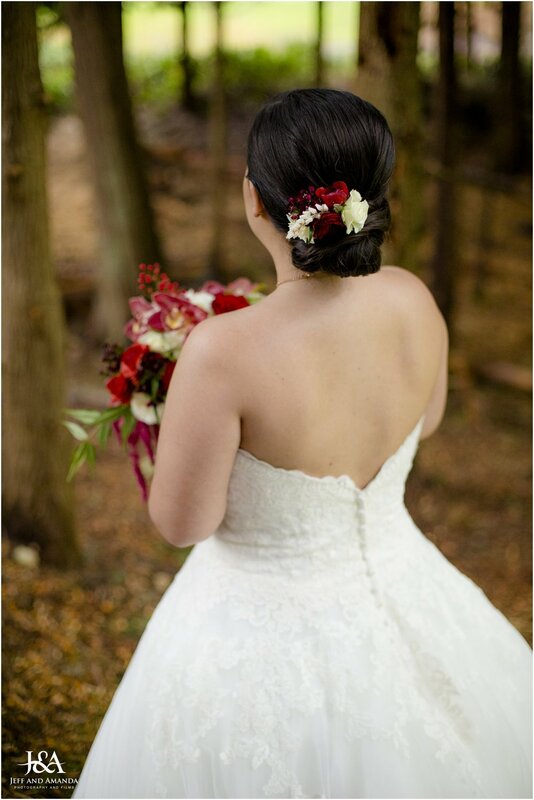 By the time your wedding rolls around that trend could be completely out or you will have seen it a million more times. When pinning things you find on Pinterest for your wedding, keep that in mind. Burlap and lace anyone? 2. 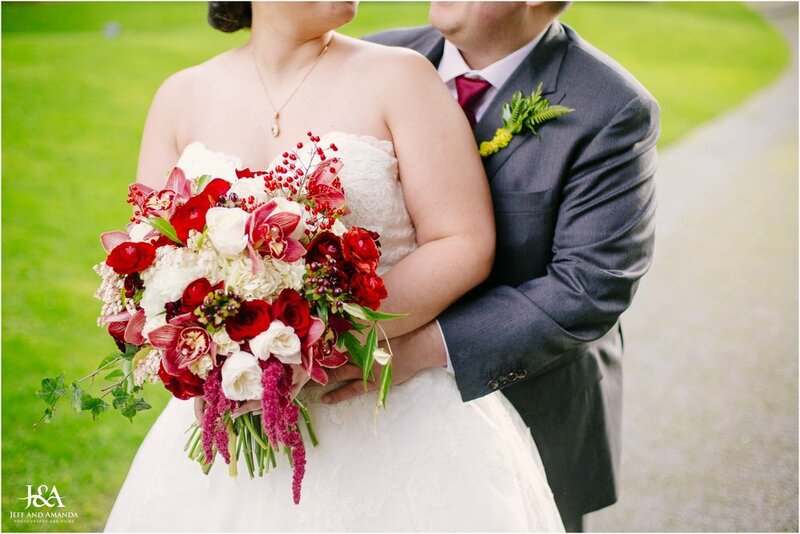 A lot of what you see are STAGED weddings (styled shoots). 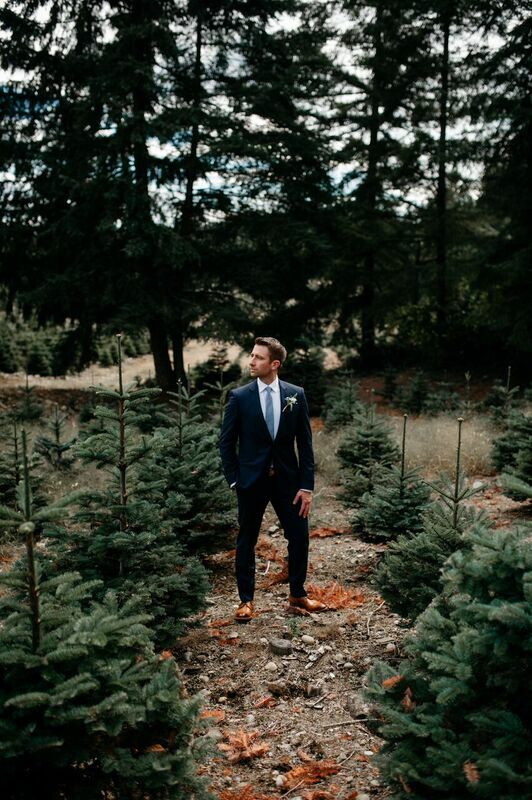 Meaning that the picture perfectness is not truly obtainable without some major planning and coordination-- and this can be limited by budget. Speaking of Pinterest....Brides will often miscalculate how much time & effort goes into a DIY/Pinterest project and often end up with a fail or unfinished project resulting in stress or even more time and money with last minute trips to the store to purchase something like you originally wanted with an even higher price tag. Make sure you really carve out the time & effort before you start a DIY project. You might find that in the end, purchasing the completed items instead of buying piece-meal materials that add up and eat up your time & money are a better choice from the get-go. 4. Not asking your vendors the right questions when interviewing them. Make sure you get to know your vendors a bit before you book them. Besides the obvious questions such as their cancellation policy or asking for references, get to know them a bit and make sure you like them. 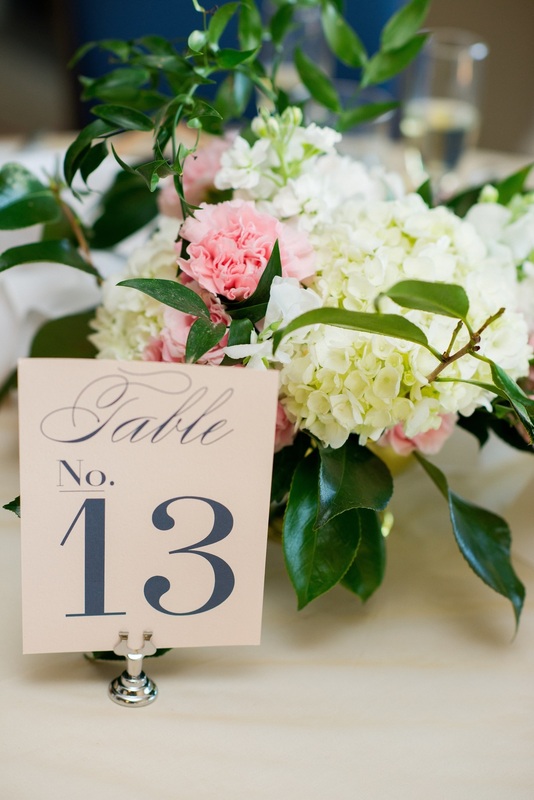 (Depending on which vendor) you'll be spending your entire wedding day with them. One of the biggest days of your life. Make sure your personalities are a good fit. Just because a friend highly recommends someone, doesn't necessarily mean they are a great fit for you. Of course there is also the old saying "you get what you pay for," which can often be true. Be wary of budget vendors. 3. Not confirming with your vendors the week of the wedding. You booked most of your vendors 11 months ago and have exchanged a few emails. Don't leave it to guess work for them to know what time they can or can't show up or that they know what the game plan is. Make certain they know what time to be there and what is happening and when, which leads us to #2. 2. Not having a day-of timeline. 1. Not hiring a day-of coordinator. 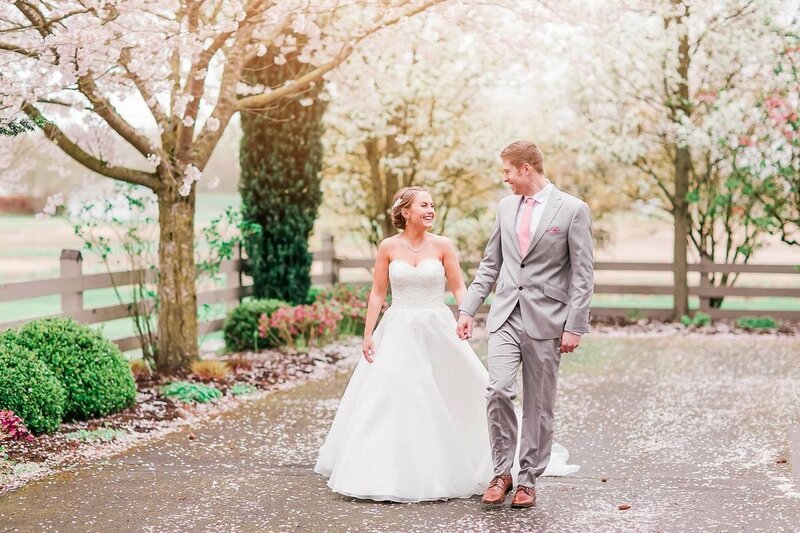 Sara & Blair had a beautiful intimate wedding in a cherry blossom wonderland, at Maplehurst Farm. 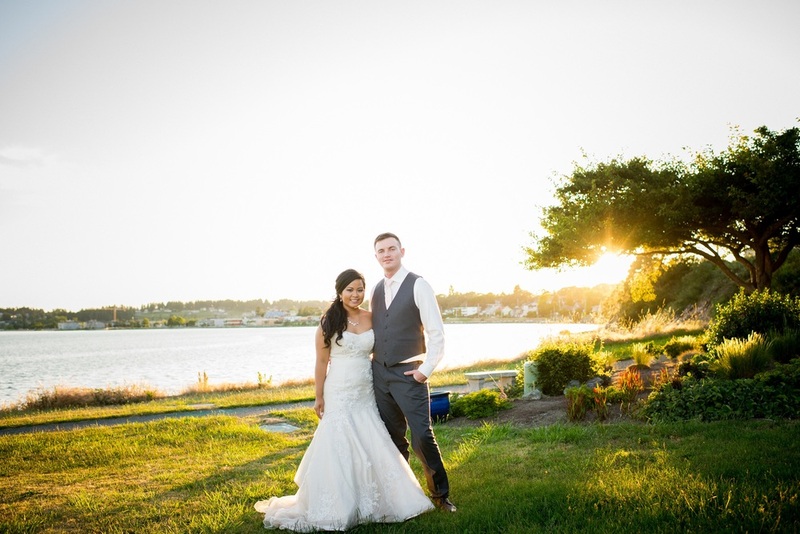 In Skagit Valley with the view of Mount Baker, the venue was fitting for Sara and Blair's wedding! 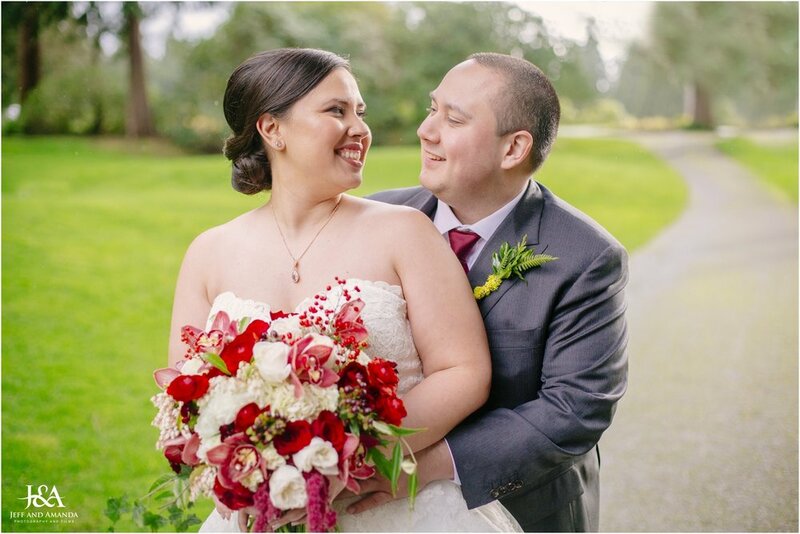 Their brewery themed wedding had so many highlights and I'm excited to share these photos with you! 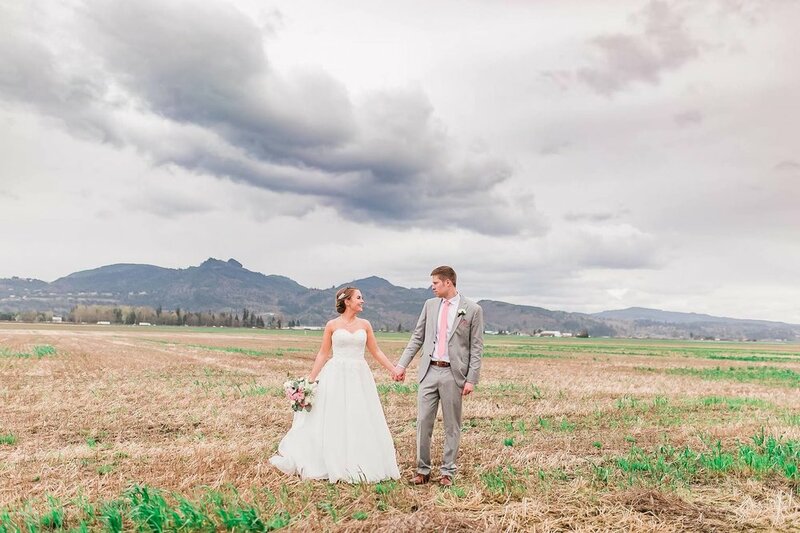 The week before their wedding, we were expecting a huge wind storm but we were blessed with accommodating weather! Despite the hurdles,our awesome team members and vendors worked through because of the rain, and their day still ended up perfect! 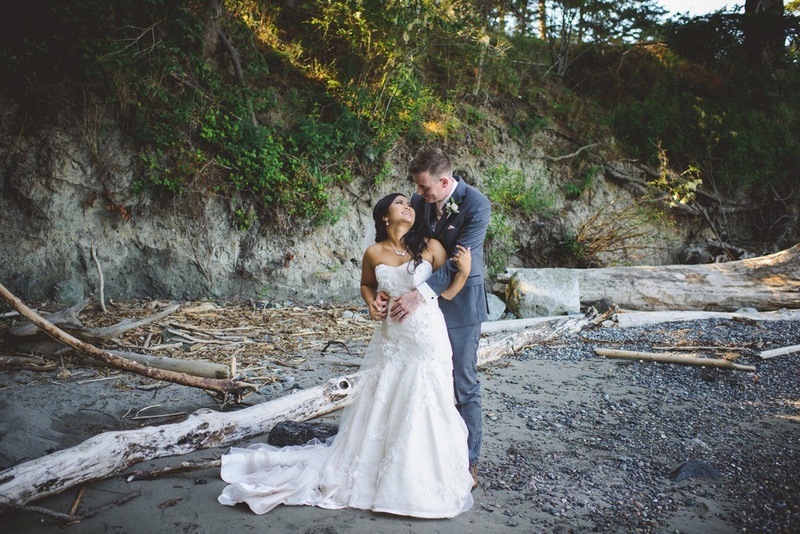 This wedding was a real challenge: we had to plan a wedding from scratch in three months! We knew we were up for the task! 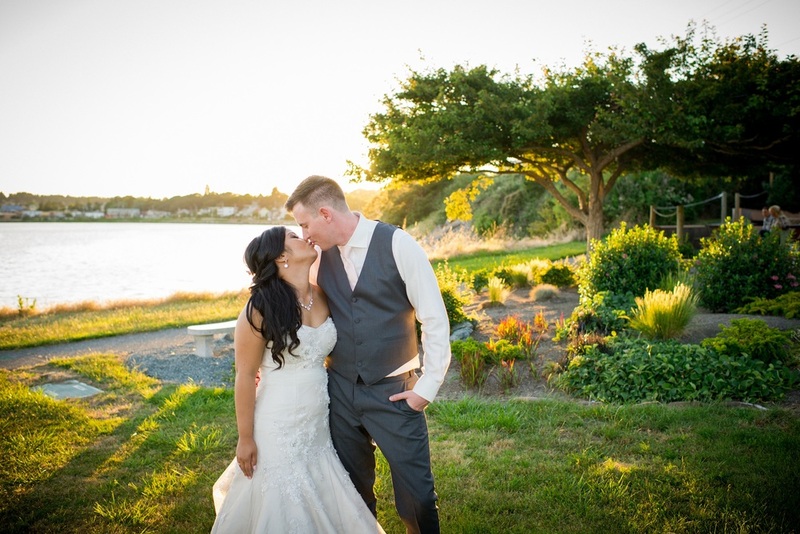 Ken and Lydia are such a sweet couple and we loved working with them. 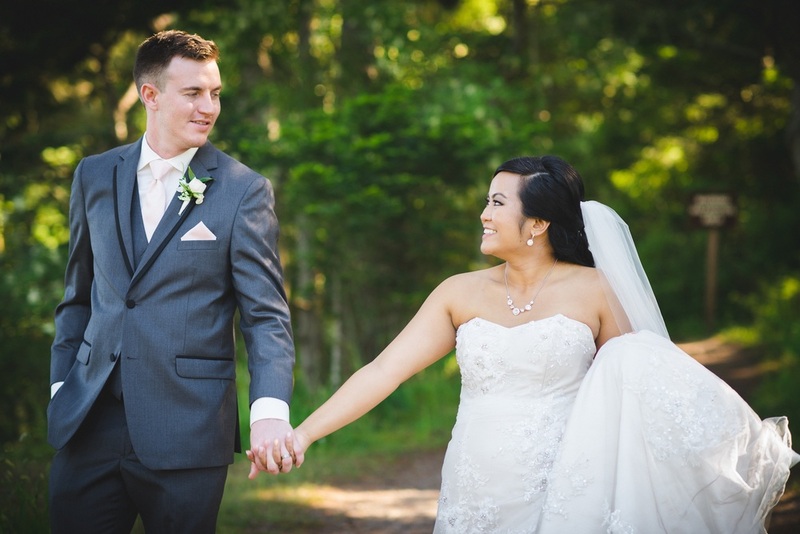 Ken and Lydia had a vision of what their wedding would look like and it was basically a dream come true! 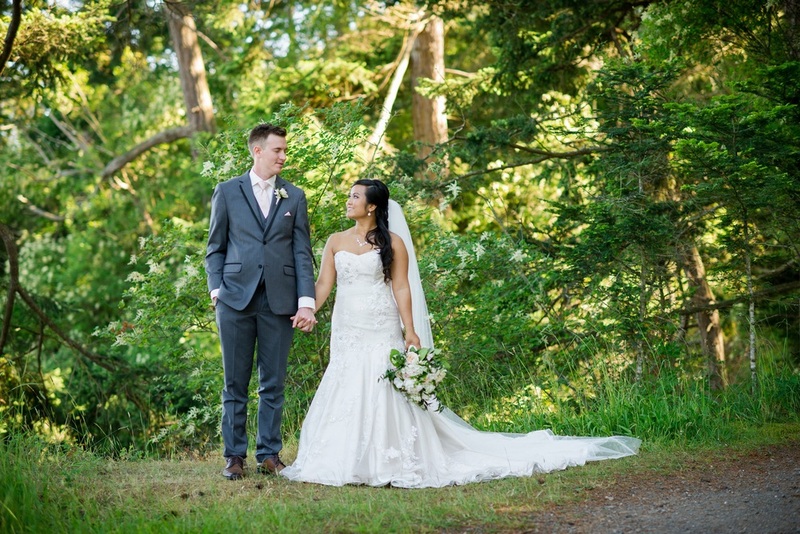 Their fairytale themed wedding looked like it came straight out of a movie! 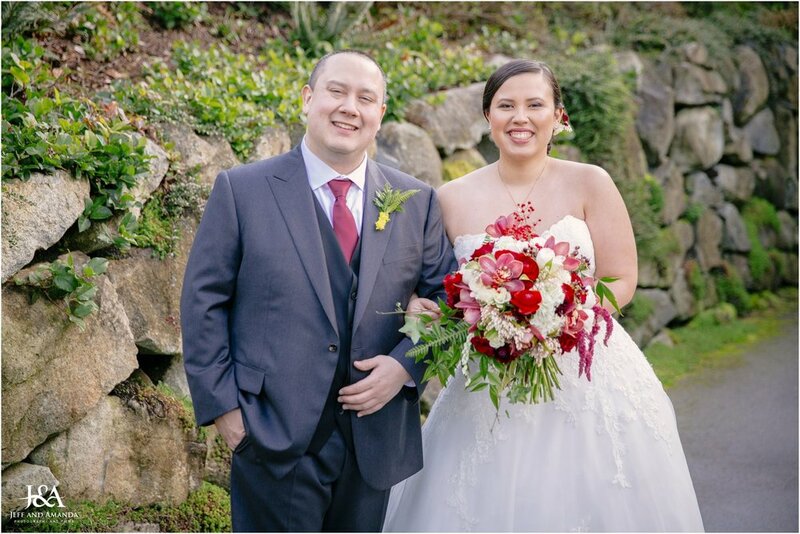 The wedding took place at the breathtaking Thornewood Castle, a 500-year-old Tudor Gothic historic site known as “the house that love built.” The castle has a huge backyard and a beautiful garden with a fountain. 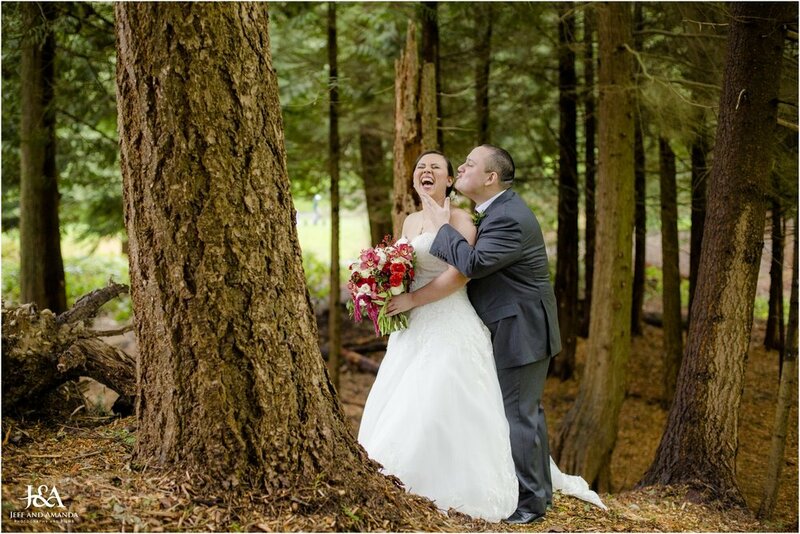 There is something enchanting about this place and it was the perfect location for Ken and Lydia's fairytale themed wedding. 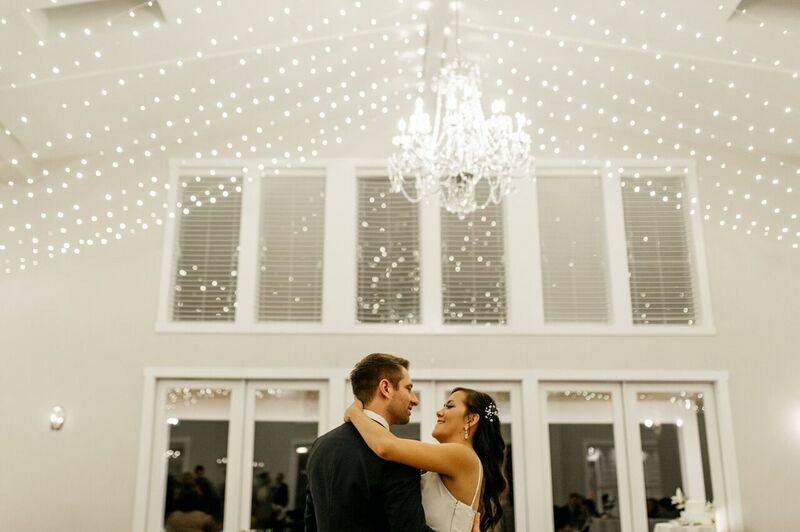 A huge thank you to Alex Studio for capturing these beautiful moments! Who said brides could only have one dress? Lydia had four! 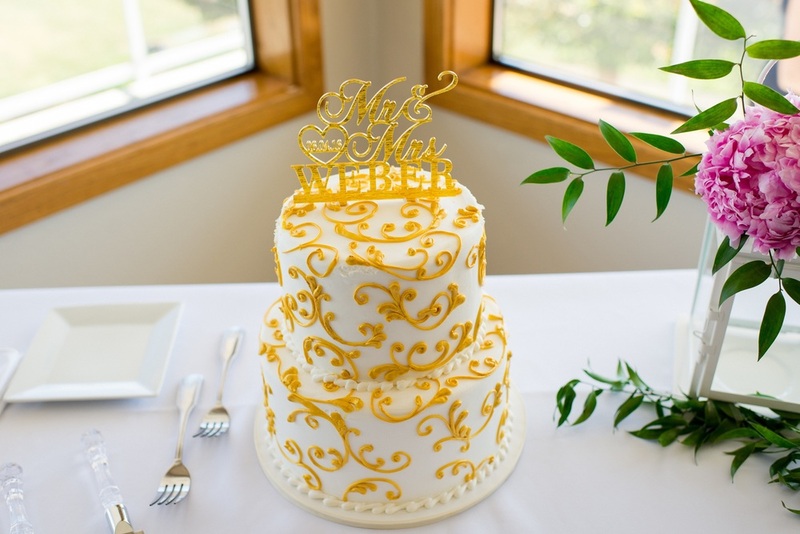 The cake, made by Mike's Amazing Cakes, was four layers tall and had little intricate sugar flower petals and gold detailing. It looked too good to eat! 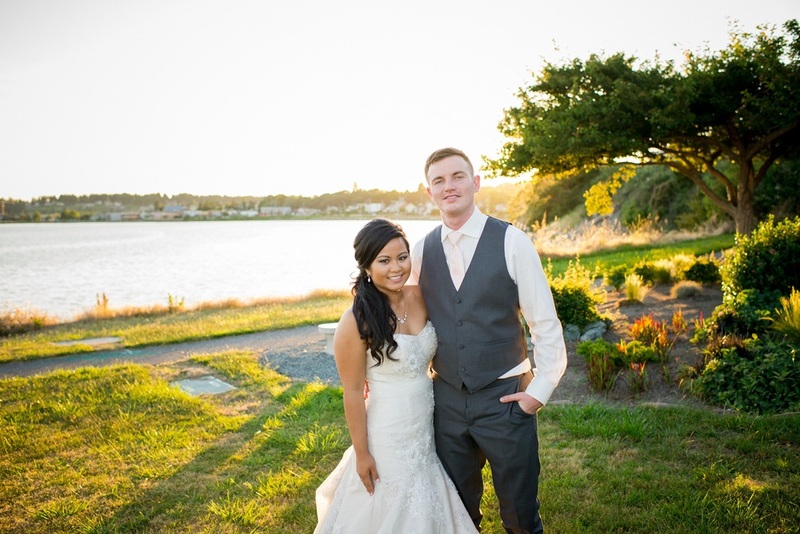 This was one of my favorite weddings we had the pleasure to plan this summer! Truthfully, hanging out with this couple was always a joyous occasion...even though they make me feel so short! Jess and Eric got engaged in Disneyland, surrounded by family. I encourage you to take a look through this wedding album and see that their engagement carried into their wedding without a single misstep. 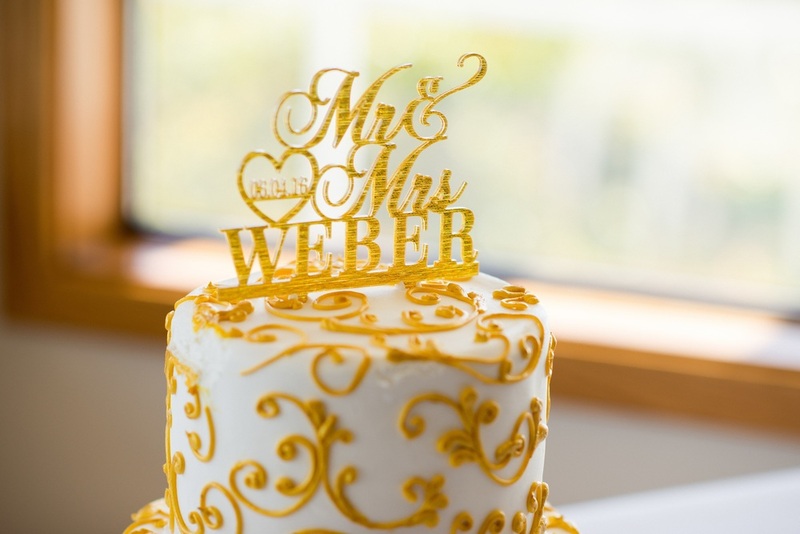 Subtle Disney details come through from the table names to the cake topper, but mostly you see the love, family, and friends. 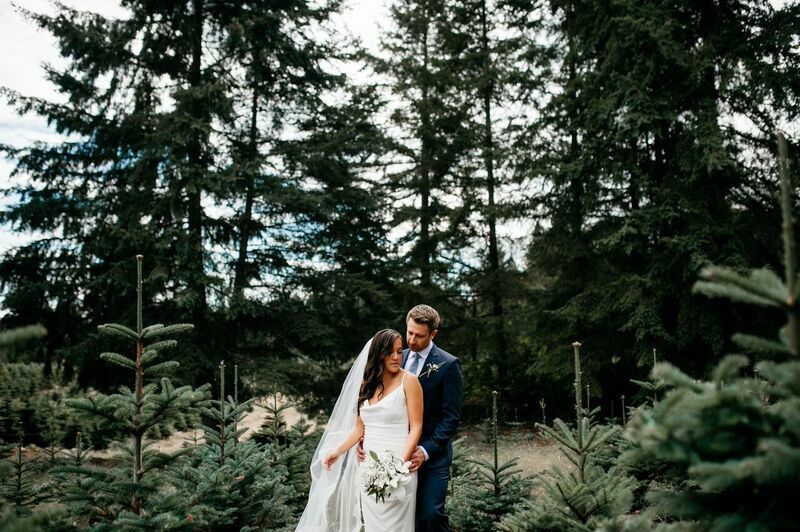 This June wedding was my first rehearsal I worked in a backyard...and in the pouring rain. As you'll see in the photos though, the Wedding Day was flawless. Cheers to you Jess and Eric (Rheya too! 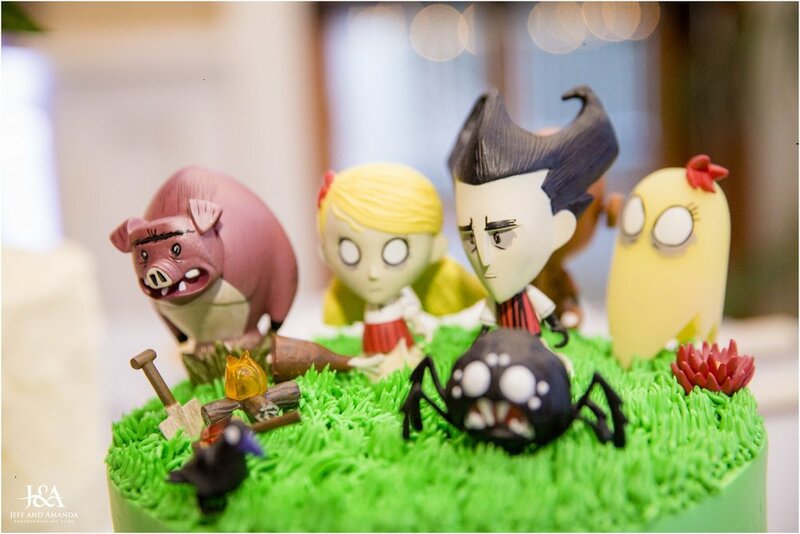 ), we wish you many years of happiness. Everybody.... HEAD TO THE BAR! One thing that I love about weddings is... the BAR (open bars are obviously the best) ;-) Anyways, the bar is where the start of your fun night begins. No matter if you get a Mai Tai or if you get a Coke, you will always be on the dance floor giving it all you've got. 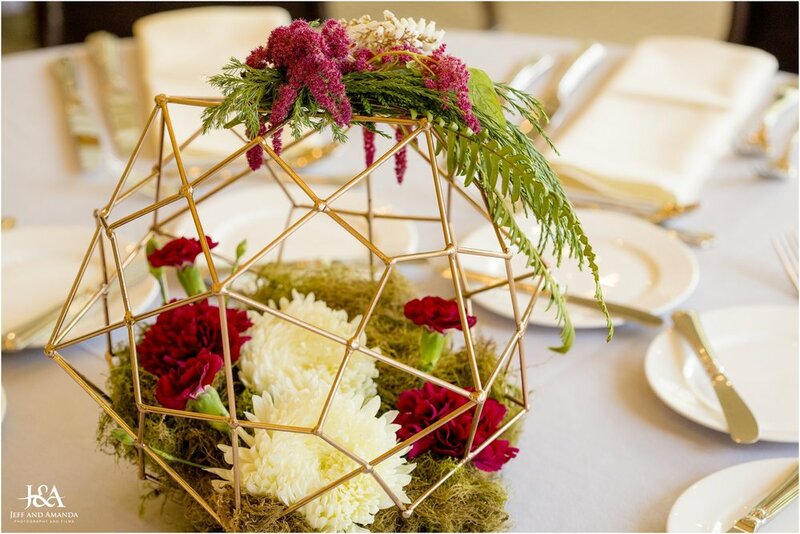 Every wedding that we plan, we love to decorate the bar with lots of greenery, floral arrangements, lights, votives, you name it! 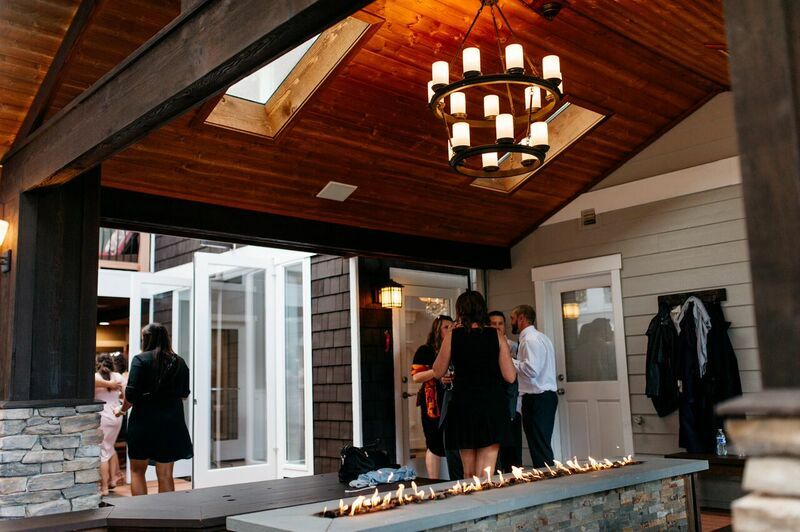 Here are some of our favorite bars from real weddings that we've done! Now if you're a pinterest lover like I am, you will see a variety of ways of how you can decorate your wedding bar! Some are sweet and simple, some are elegant and classy, and the really cool ones are very extravagant with a lot of crystals and wine glasses!!! 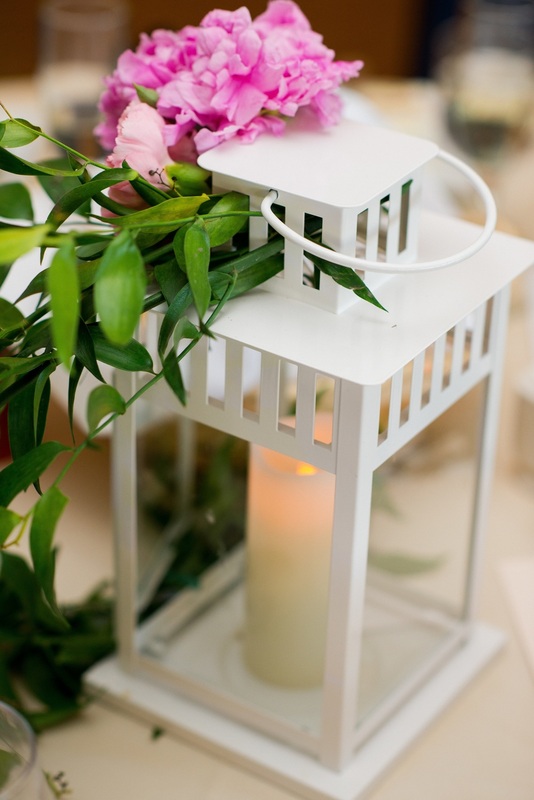 There are so many different ways to decorate your bar at your wedding it's really hard to choose the design! Check out my favorite pins in my CHEERS album on Pinterest! Enjoy! Comment down below what your favorite drink is and have a drink for me! 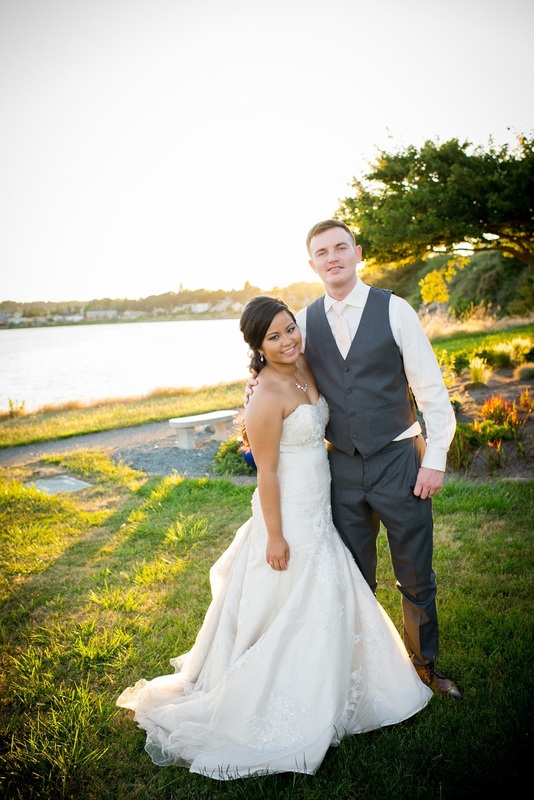 Tips for Shopping for that Perfect Wedding Gown! Congratulations on your engagement! 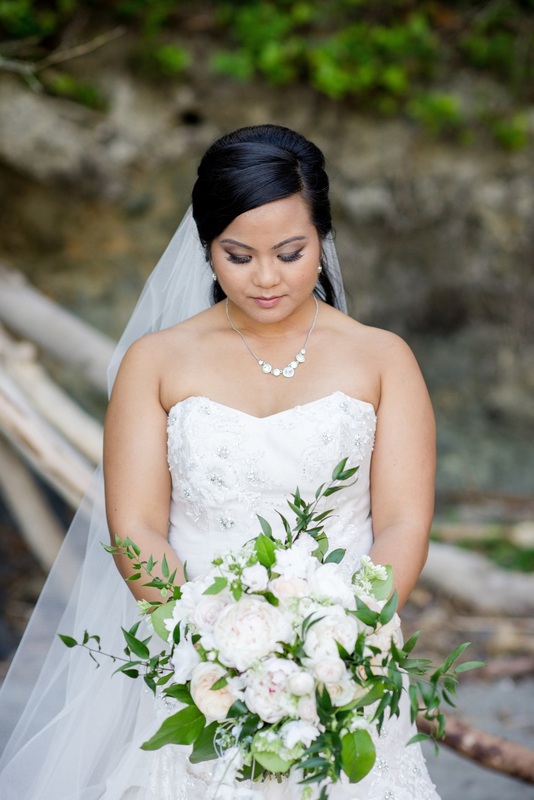 Now is the time for you to celebrate being a bride. One of the most exciting parts of this time is shopping for your wedding dress. While I know this process may seem a bit daunting, it’s nothing a well informed bride can’t handle. As a part time bridal stylist I’ve picked up a few tips to help you make dress shopping a breeze! Make sure to start shopping early! It can take up to eight months to order a gown, so the sooner the better. There are also always options like off the rack for the more laid back bride. If you’re planning to look at several stores, try to pace out your shopping. I wouldn’t recommend more than two appointments a day. As tempting as it may be to visit every shop in one day, you can only try on so many lovely white dresses before they all blend together. So start early and spread out those appointments. While shopping can be a blast and you may want to bring everyone you love along with you, it’s important to consider whom you ask to help out. Try to pick no more than four people to be your support as you shop. Any more than that and there can be too many opinions. Make sure that everyone you bring with you is someone whose opinions you value. More importantly, make sure they value yours. The people you surround yourself with in an appointment can have a large effect on how it goes. I love ‘Say Yes to the Dress’ as much as the next girl, but dress shopping in real life is rarely like the show. You don’t need to spend thousands of dollars on the dress of your dreams. There’s no magic number of dresses; yours could be the first or the thirtieth. Don’t wait for tears to be the signal to say yes. 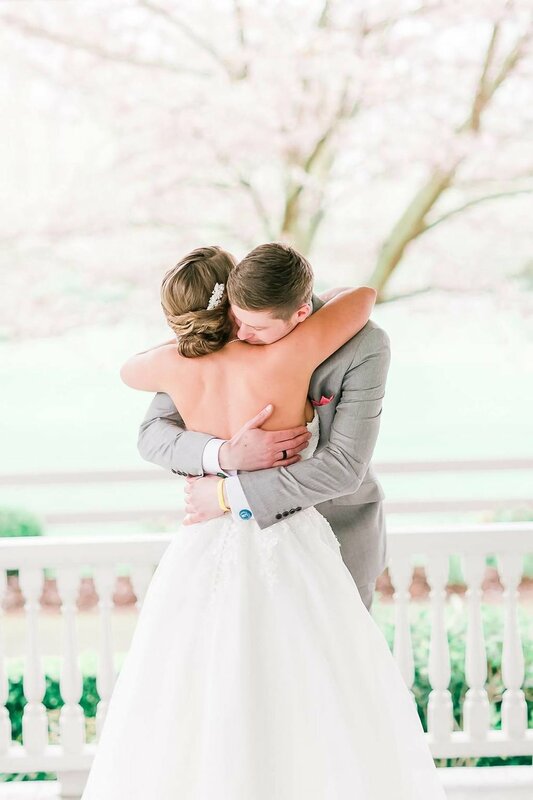 So rarely do brides cry when they find the one. Instead focus on your initial reaction. 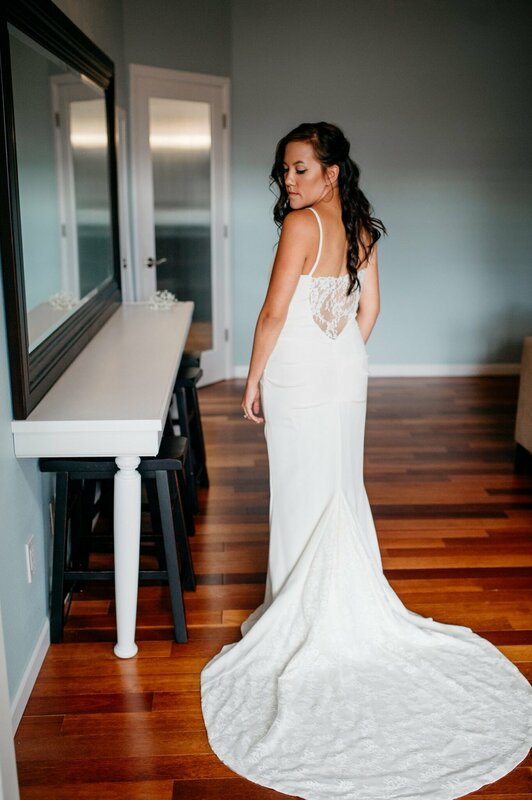 This of course will be different for each bride, but it’s often the dress you can’t stop smiling in, or the one you just want to boogie or twirl in, or the dress that you just don’t want to take off because you look and feel so gorgeous in it. When it comes to your first appointment, try to come in with some ideas of dresses that you could picture wearing. Pinterest can be a great tool for this and being able to show your consultant pictures is extremely helpful. Since it can be hard to tell what you truly love without trying anything on though, make sure to pull some dresses in different shapes to see how they look on your body. You may be surprised by what you find! So often brides will come in with a vision in mind and end up leaving the shop with the dress of their dreams in a completely different style. I hope that these tips can help make shopping for your dress an easy and memorable experience. Have fun ladies! At It's Your Day Events & Expressions, we love nothing more than to travel with you on your journey in binding your love! 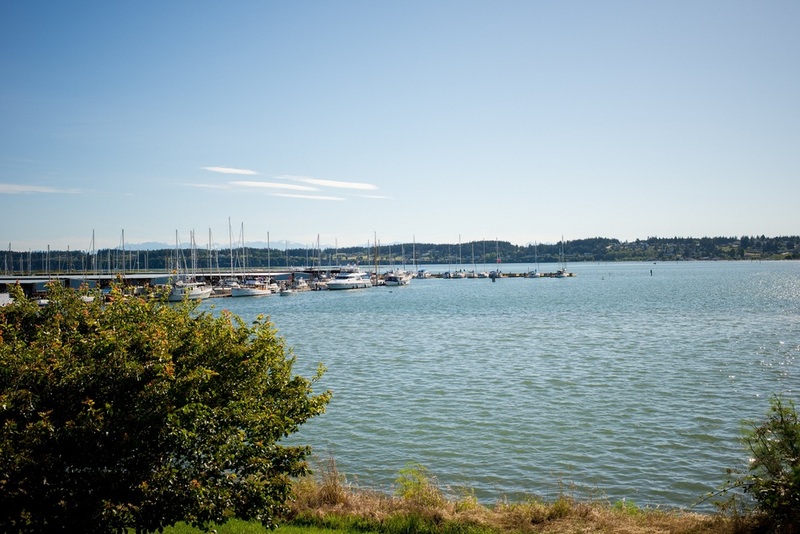 Ashley and I (Kailin) took a mini road trip up to Oak Harbour and wow was it such a pretty sight to see but it was really hot! Ashley's driver sides window wasn't working but we cooled off with a blended mocha and made the best of it. Now.. Back to the wedding!!! St. Mary's Church was so beautiful! The Ceremony was beautiful! The bridesmaids and the bride, Kristine were extra beautiful!! Everything just looked so perfect. You'll have to look for yourself. 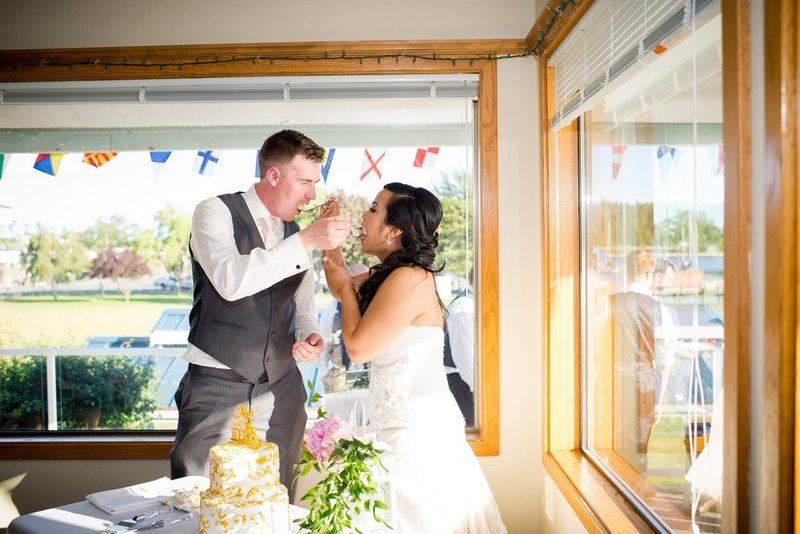 :-) Here are the pictures that were taken during the ceremony and the reception! It was just such a lovely time with the most lovely couple!!! Congratulations again! 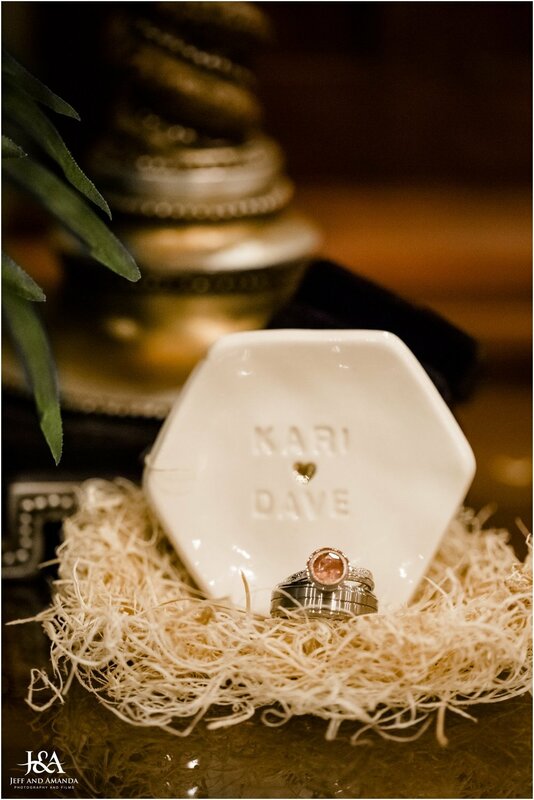 If I could only choose one word for our wonderful couple, Kari and Dave, it would have to be candid. Nothing is more beautiful than candidness, and the fun that the both of them have together, makes them the perfect couple in life. While going through these photos, I couldn't help but notice my smile growing bigger and bigger as I go through each picture. Some pictures made me laugh because the picture captures Kari and Dave's expressions so well, it is like I can hear them saying silly things and laughing right at that moment. You will understand what I mean as you take a look at these photos. 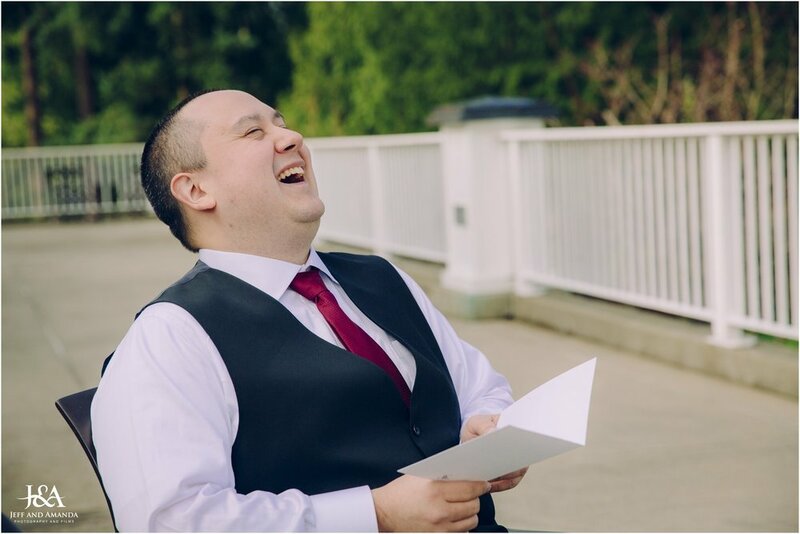 Laughter and happiness is contagious! 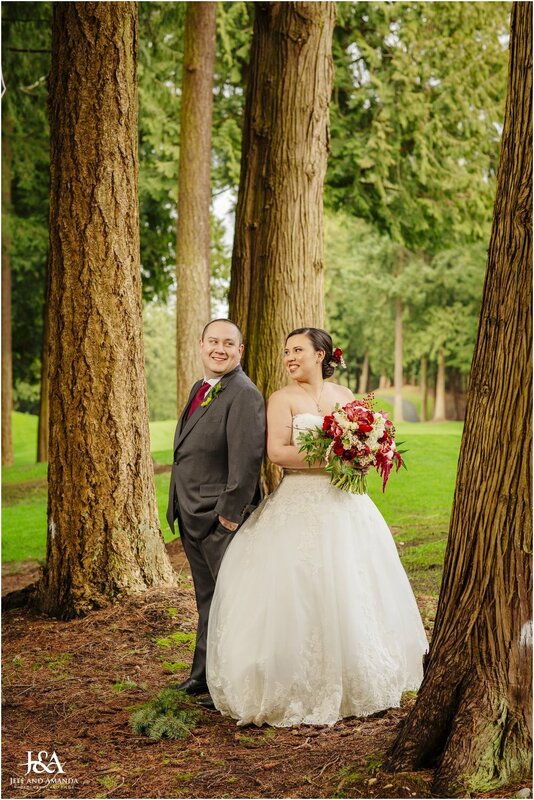 Here are some of my favorite shots from that awesome day! 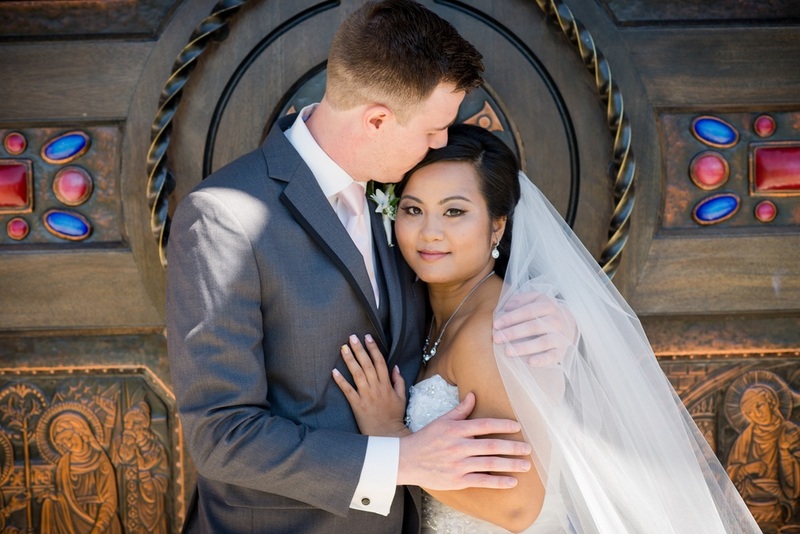 Thanks to Jeff and Amanda Photography! You guys did a phenomenal job! 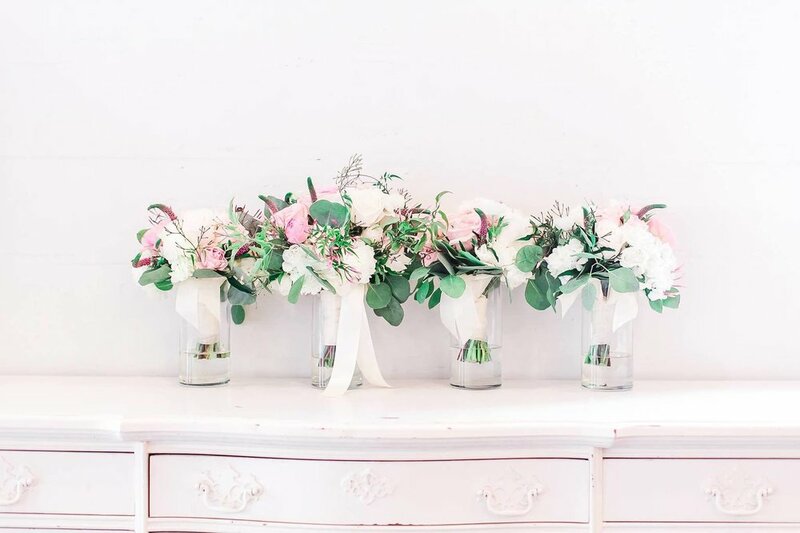 It’s Wedding Season again, which means lots of upcoming meetings with clients for us and other wedding industry professionals, and plenty of help and advice to be given. 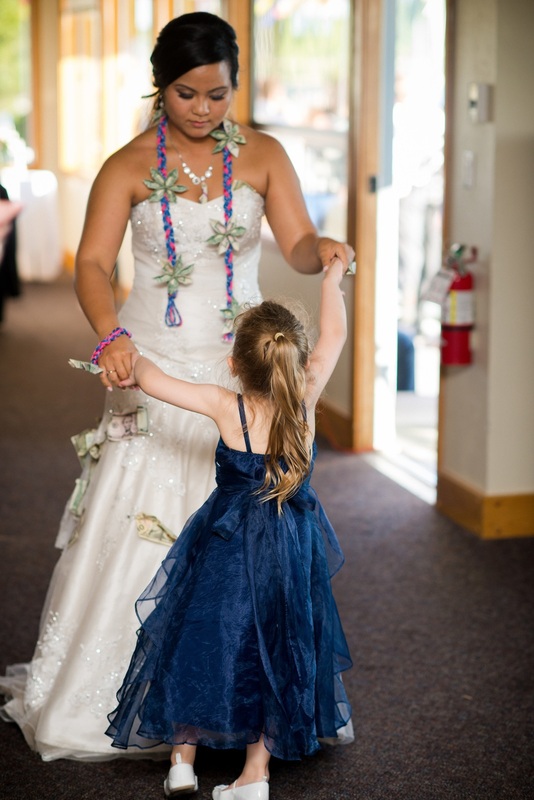 One question that we get asked very often as wedding planners is, how much should I tip each of my vendors? And even, should I tip this vendor? This is a great question but can be very complex to answer. 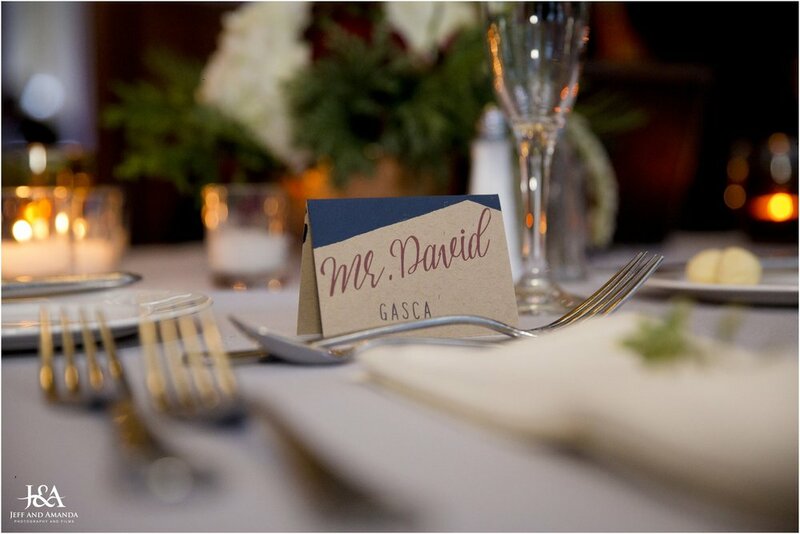 Often times we have given our opinion that we have based on what's written in the “etiquette guides” yet tried to balance it out what we have more commonly seen, whilst taking into account what the vendor is charging, what the contract says and checking for any built-in fees. What you want to do first is check your contracts. Some vendors may already have gratuity built in such as the caterer (usually 15-22%) or the shuttle or limo driver. Read through carefully to avoid unnecessary double tipping. The Knot had an interesting note about not needing to tip owners of businesses. “If your photographer owns the studio, there’s no need to tip him. The same goes for bands not booked through an agency and the beauty-shop owner who does your hair.” To us, this seems a bit odd. 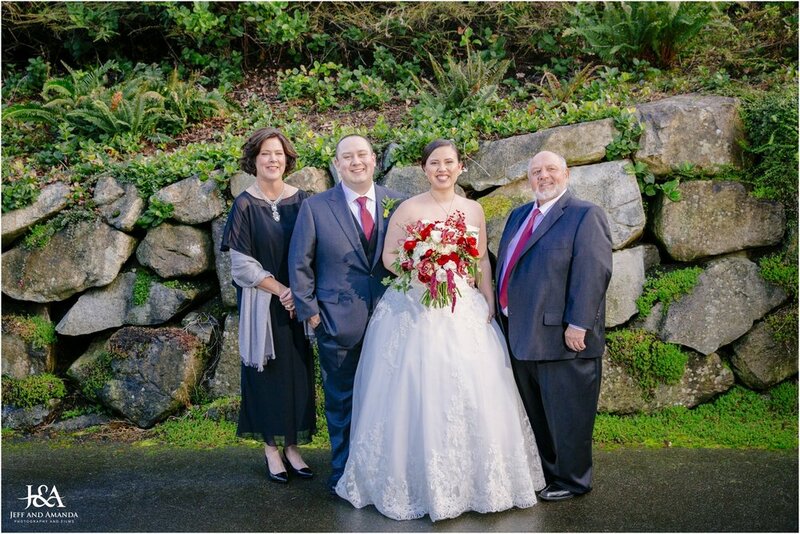 Most wedding businesses in the Seattle area are run by owner-operators who work hard and wouldn’t mind feeling the love too. According to the Knot about 50% of couples tip their planner. If you do tip, Real Simple suggests 15% of the fee or a personal gift. With a $4k planning fee that could be a hefty tip of $600. Trust us, that is not required. If you want to do cash, likely closer to 10% or slightly less would work. Speaking frankly, as planners ourselves, we never expect a tip but are always honored when we do receive one. A few times we have gotten gifts from valued clients such as glassy babies or our favorite make-up. It was totally unexpected but we were thrilled and felt appreciated. What really touches us the most are indeed thank you cards or huge hugs and words of thanks. The gratitude is what keeps us going in this business and it is the feeling that leaves us buzzed at the end of a fabulous wedding event. This would include people like the cake delivery person, florist set up team, ice sculpture crew, special rental set up team etc. This can depend on the size of the crew but typically $10-20 a person is good. If it is just one person doing a lot of work (like a florist) you can even go bigger, like $50+ (if you want!) You can prepare for the multiple tips by having labeled envelopes ready to hand out. 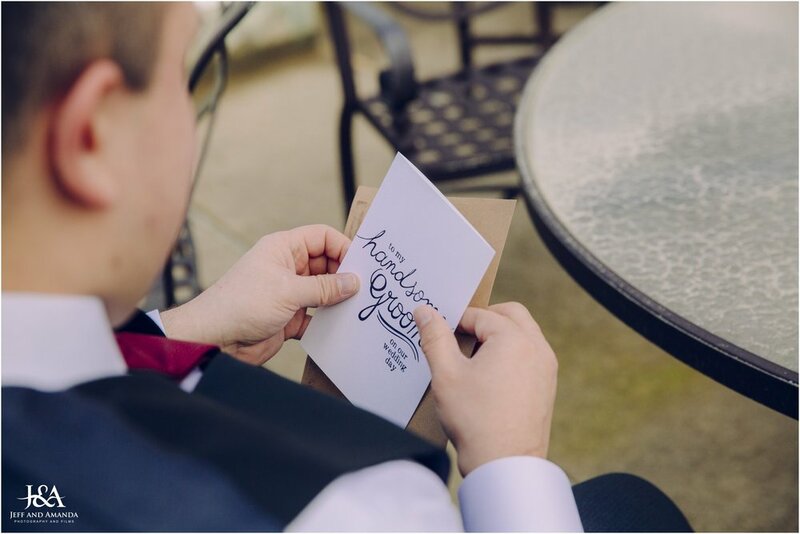 Assign the task of handing out to your planner or Best Man. If your officiant is tied to a church or synagogue, you would most likely be expected to make a donation to the organization. According to the Knot, “If you're a member you'll probably want to give a larger amount than if you're not. 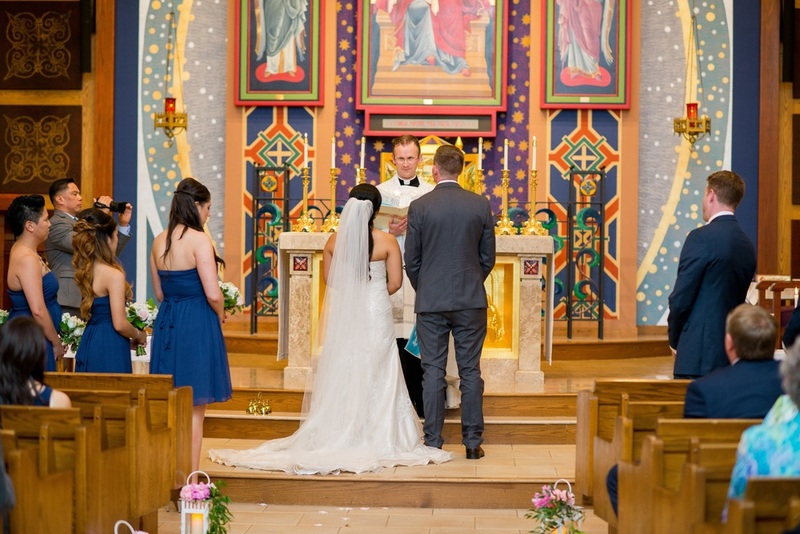 However, if you're getting married there and they're charging you to use the space, feel free to give a smaller amount.” Often a donation of about $500 (give or take) to the church is expected, with an optional $50-200 to the officiant. However, if you are not affiliated with a church, no donation would be required but the $50-100 tip is still appreciated. If your best friend from childhood, Joe Beaujangles is marrying you, he may be offended if you offer him a tip. When you hire one of your peoples, opt for a personal gift instead. If you’ve set up a great team of musicians that helped you pull off that perfect score to your wedding, consider giving them a little monetary reward to thank them for their musical talent. 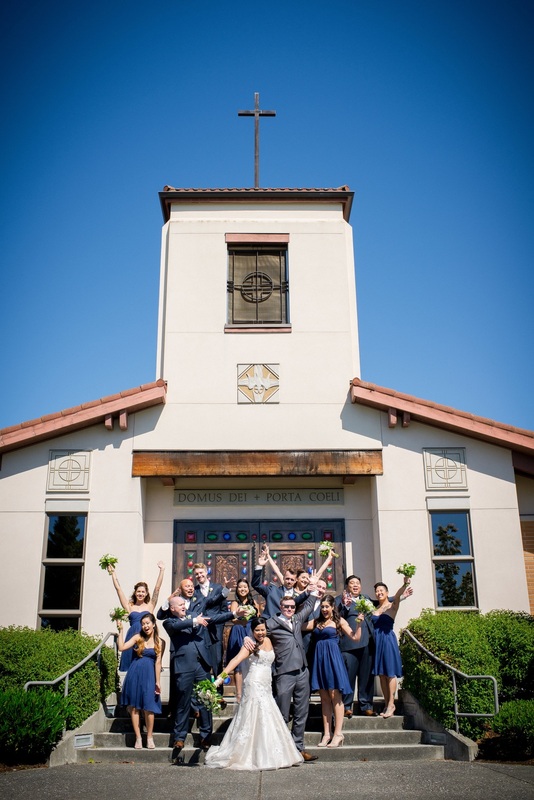 And as stated from The Knot, “However, you probably don't have to tip the solo church organist who was required to play.” The standard is about $15-20 per musician and can be given after the ceremony is over. Photographers Stefan & Audrey (owners of their self-titled photography business) stated that they receive a gratuity or gift every 15 or so weddings, so not too often. They went on to say “Thank you cards/notes are more than enough though and we receive those fairly often! Cue the cheese. But honestly, friendship. We've met some awesome people and some authentic friendships have come from it.” Photographer Courtney Bowlden also mentioned thank you cards or words of thanks were greatly appreciated and that getting tips weren’t too common, maybe once or twice a year, and when asked what the best gift she has received, she replied “I got a cute scarf from a bride and it was totally unexpected. I was so blown away by her thoughtfulness.” So there you have it, a lovely gift or thanks is preferred at a minimum, but if you would like to tip, $50-$200 each is the standard. This one is fairly straightforward. This is often built into your contract so check there first. If it is not, the usual 15-20% tip is expected. Just like taking a taxi! When to tip? At the end of the night or after the last ride. 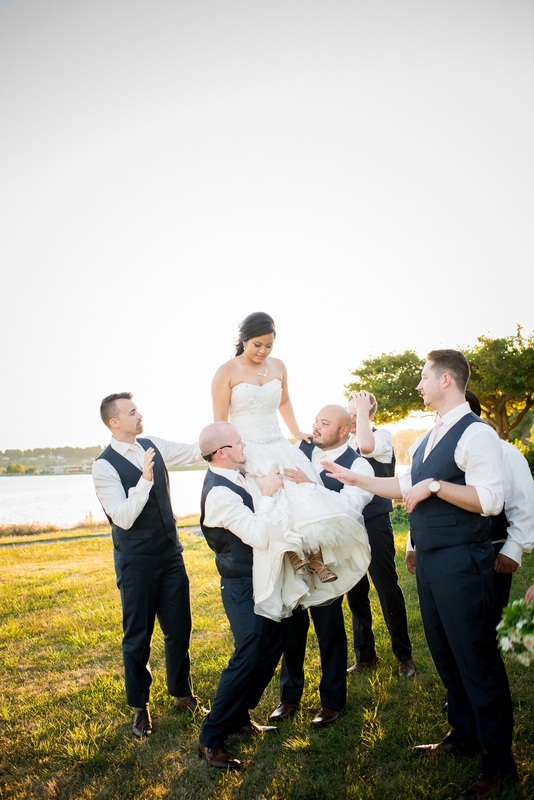 If you have shuttles or buses running you can give it to the Bus Captain to split among drivers or if it's a simple getaway car, you can give this duty to the Best Man or the Groom can do it upon exiting the car as a final option. Okay, here it is, the big one. First of all, a service fee is almost always built into the contract, so again, check there first. If you are unsure what the service fee covers, feel free to ask your catering manager. If there happens to not be a service fee or gratuity built into your contract then plan to tip about 15-20% of the food and beverage labor fee, NOT the cost of the actual food and drink. This confuses some couples as you may be used to looking at your food and beverage total like going to a restaurant. But no, you aren’t expected to tip $3-4 k extra on that $20k total catering bill. Seattle company City Catering has an 18% gratuity line on their contract however it has a note stating “An 18% gratuity line has been included with this proposal for budgeting purposes. Gratuities for our servers are left to your discretion.” For giving out gratuity, you are more than welcome to break the amount out for each staff member (again look at the contract to see how many staff is expected), but the easiest way to do it is to give an envelope to the Banquet Manager and specify it is to be split among the staff. Feel free of course to include a note of thanks inside and an indication of a certain amount going to the Banquet Caption or Bartender etc. with the rest being split among the waitstaff. So there you have it! 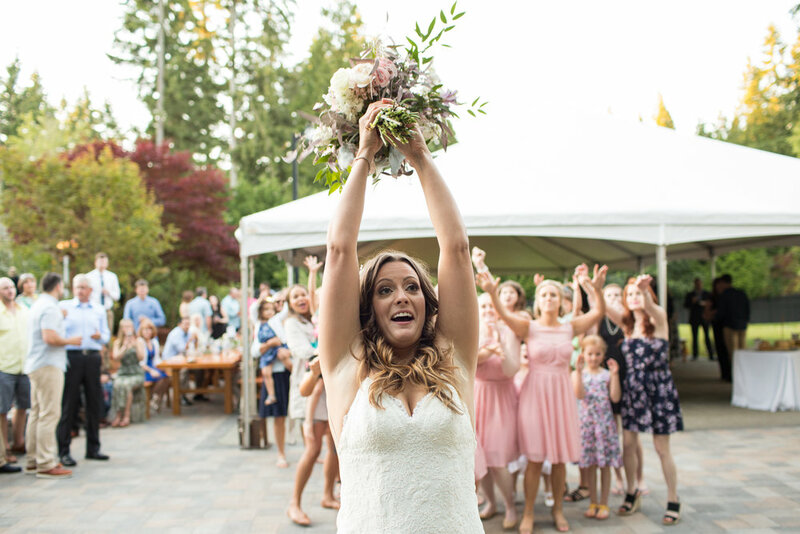 That is our guide to tipping your wedding vendors. Just do what feels right to you, and remember, a big THANK YOU goes a long way! PNW INSIDER!! The Local Sky High Love Story! The photographer's view of Alaska Airlines flight 461! 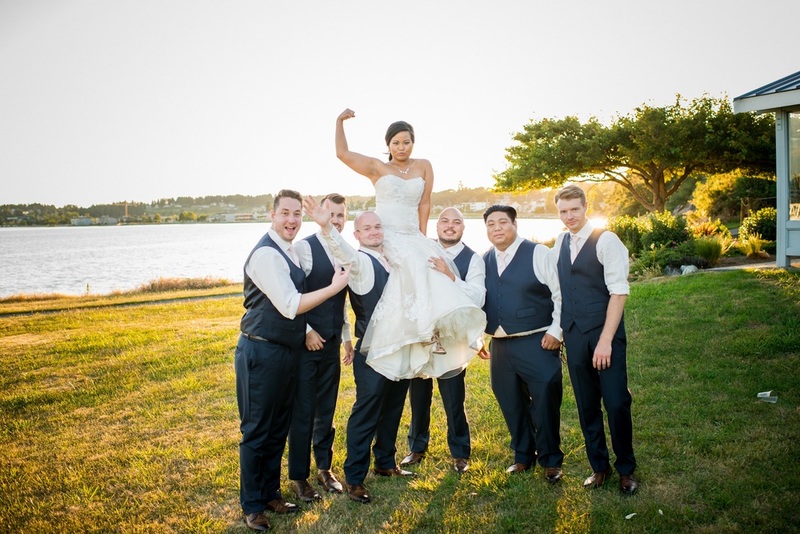 The Bride wore heels with a little Boeing flare!